We are clearing a space by selling off a collection of remnants that we have accumulated over the years. 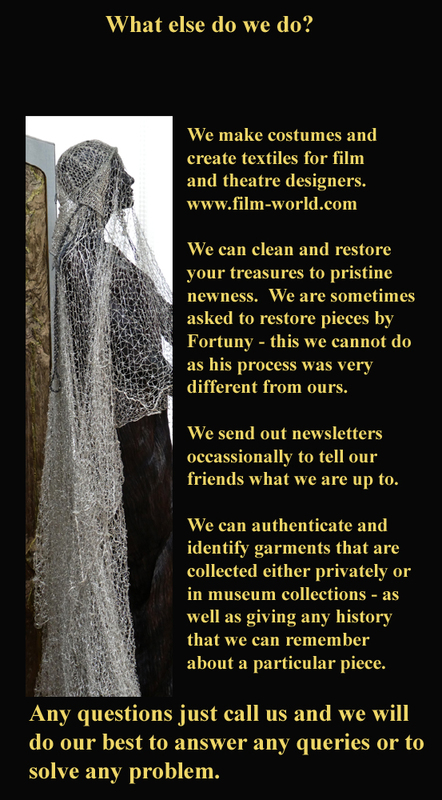 So we are holding a fabric remnant sale specifically for film and theatre production costumes or set design. 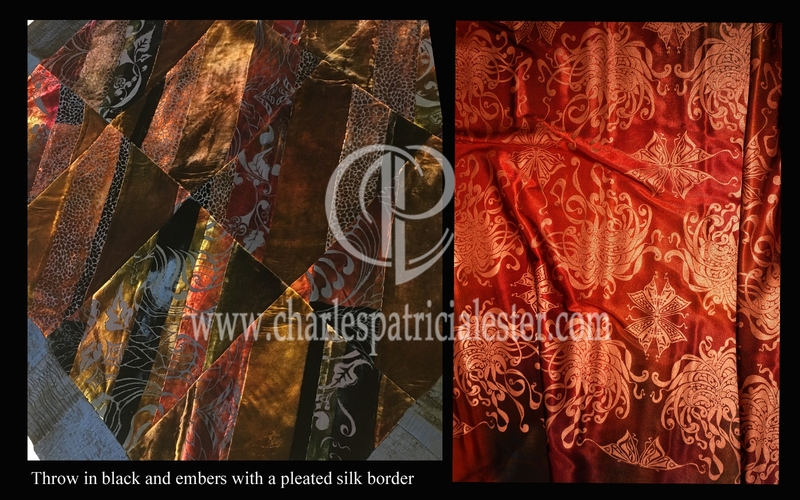 These are luxury fabric remnants that really need to find a purpose rather than cluttering up a small printing table that we need to be able to use for shorter lengths of fabric. So I have started just sorting out some in groups of colours as recently requested. I will be adding more as and when I can get the photographs done. 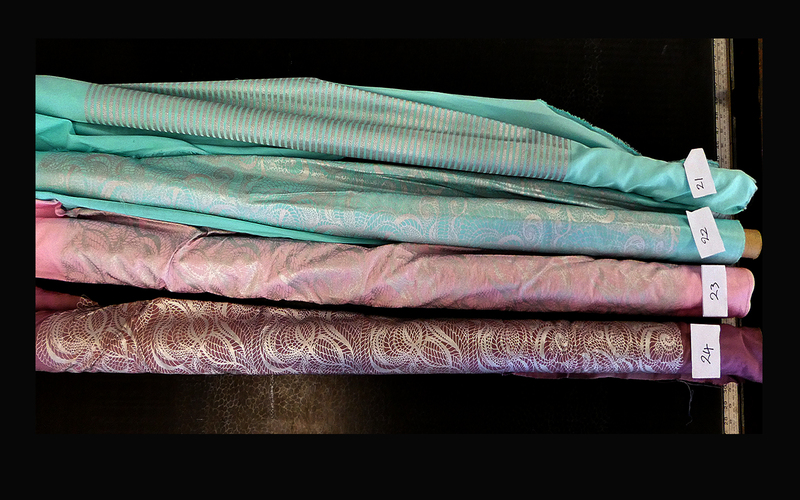 Fabric lengths and prices will be added as quickly as I can get my head in focus! Prices are reduced between 65% – 85%. Sizes will be put on here in the next couple of days. 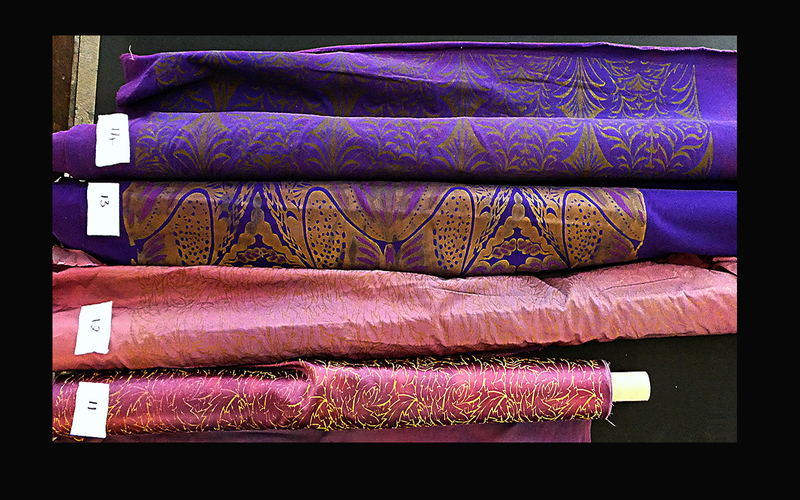 These fabric remnants are perfect for theatre productions. 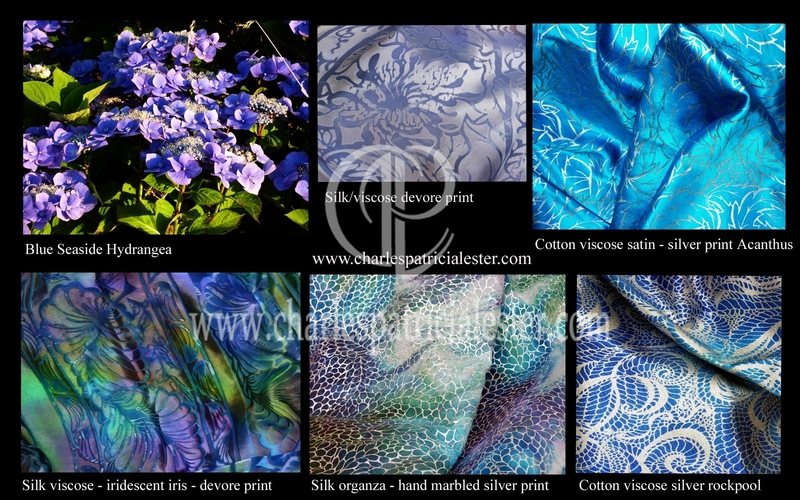 They are bold and created on pretty robust fabrics and are perfect for the rough handling associated with theatre work. 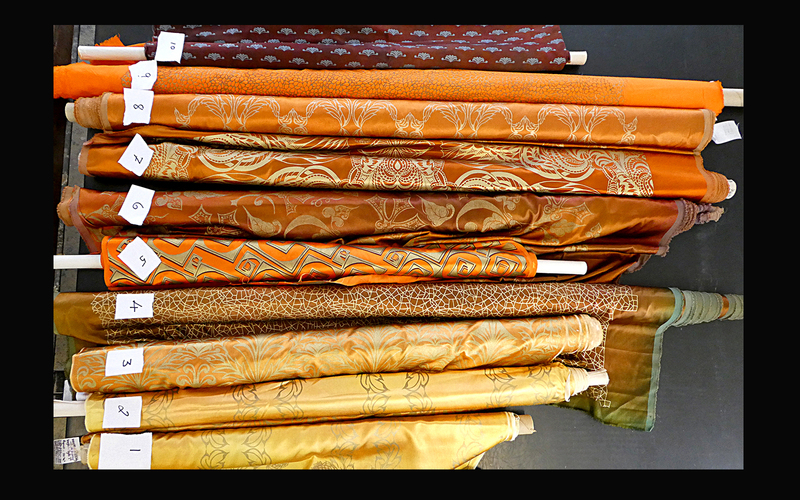 Opera drama fabric remnants in golds, ginger and orange. 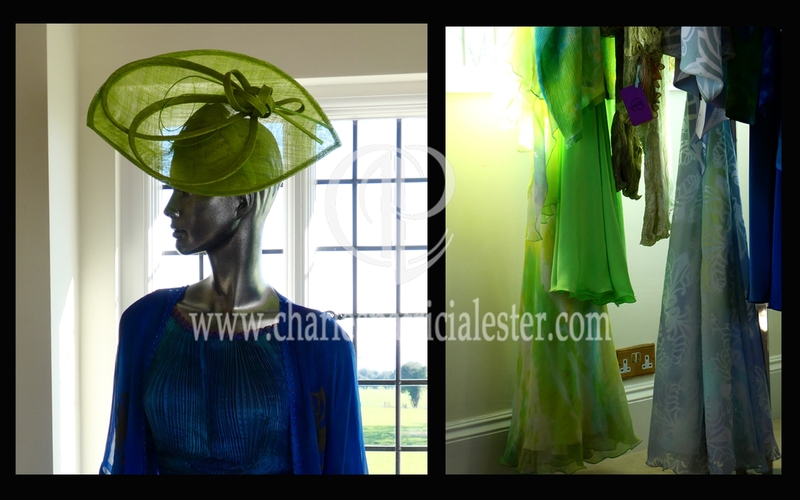 Pastel colours for feminine performance costume designs. No. 14. – heavy cord weave cotton – again more purple than it looks. Shadow printed in gold over red. This was made for lining campaign tents for a Charlemagne period film! 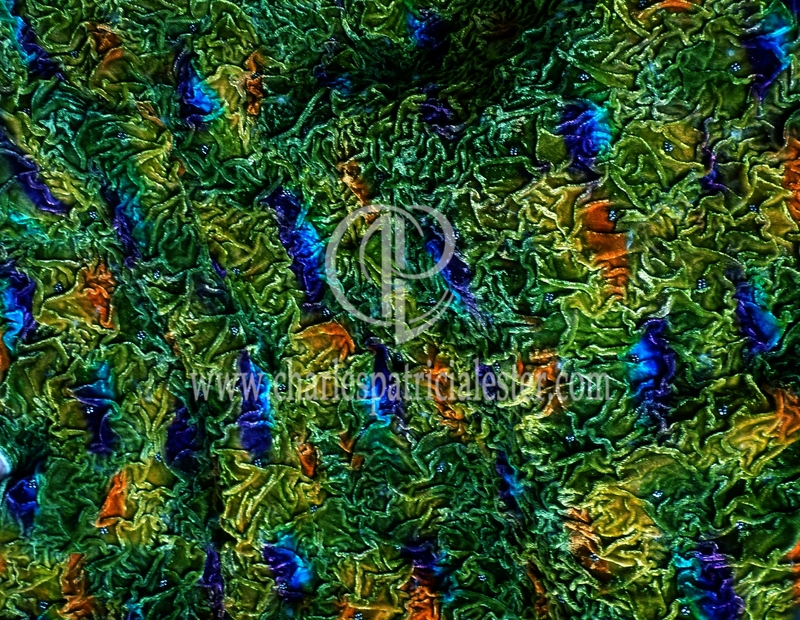 £25 per metre (ON HOLD) – there might be another piece of this lower down the pile! 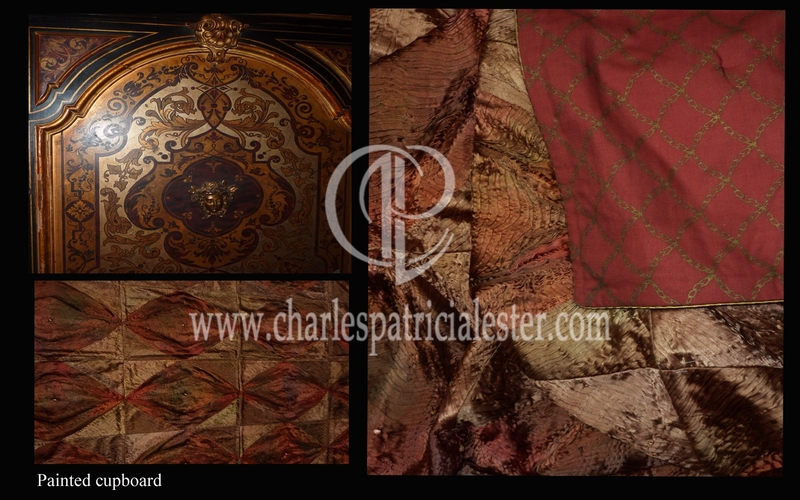 The post Fabric remnant sale film/theatre production appeared first on Gilded observations of a gilded world. I am creating a new leaflet to let people know what we do and to remind those that know us what other things we can do. 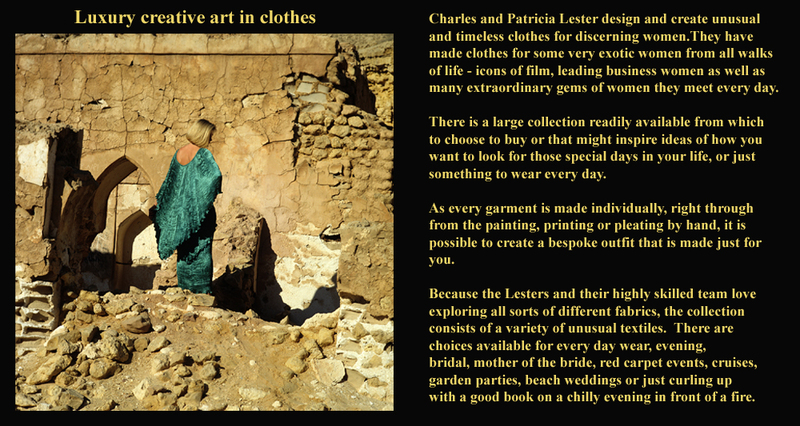 As the print is a bit small on the image I have typed out the text from ‘luxury creative art in clothes’. 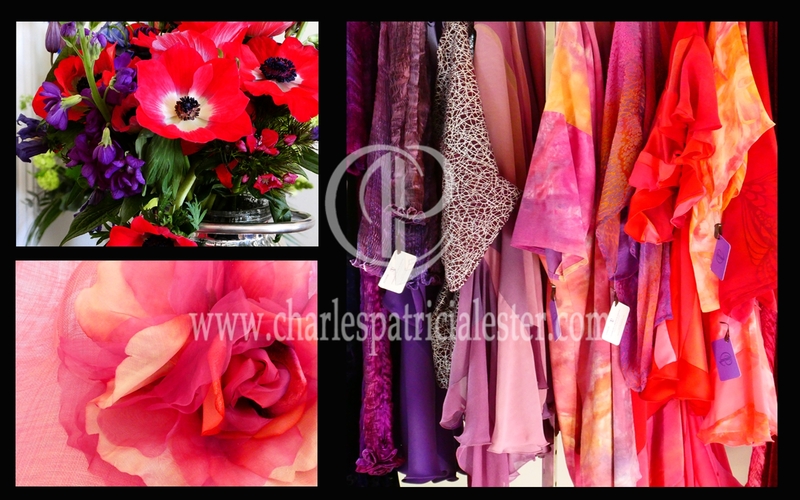 Charles and Patricia Lester design and create unusual and timeless clothes for discerning women. They have made clothes for some very exotic women from all walks of life – icons of film, business women as well as many extraordinary gems of women they meet every day. 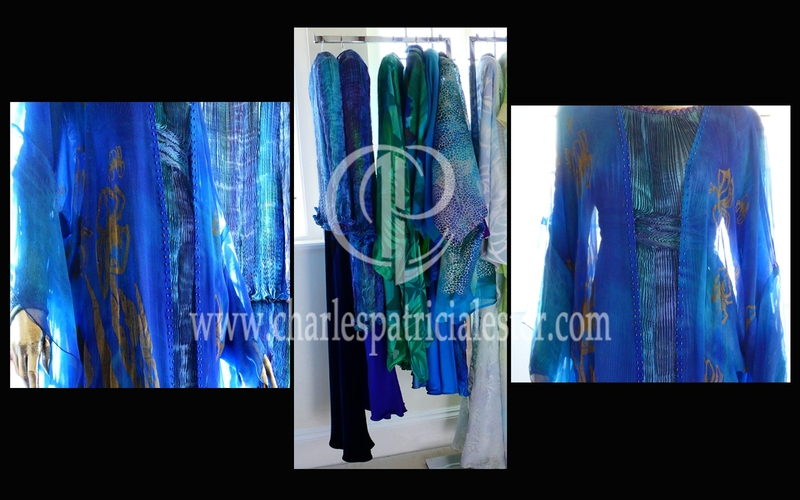 There is a large collection readily available from which too choose to buy or that might inspire ideas of how you want to look for those special days in your life or just something to wear every day. 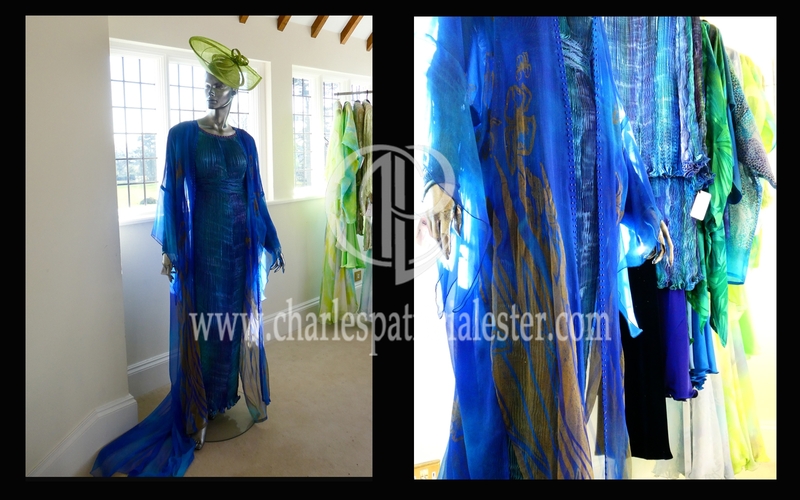 As every garment is made individually, right through from the painting, printing or pleating by hand, it is possible to create a bespoke outfit that is made just for you. 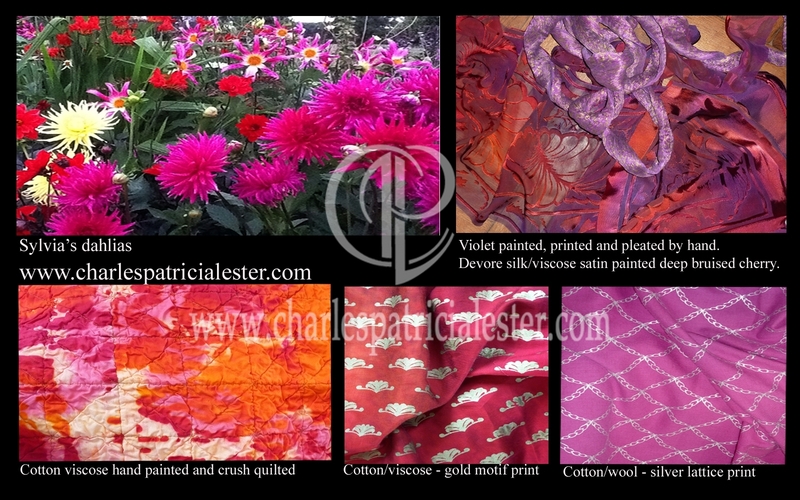 Because the Lesters and their highly skilled team love exploring all sorts of different fabrics, the collection consists of a variety of unusual fabrics. 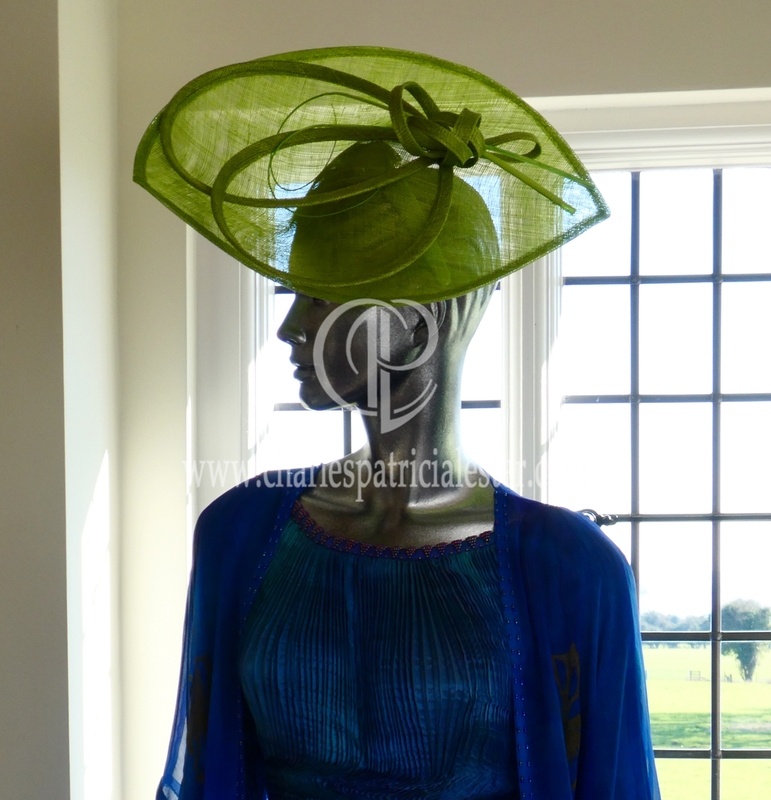 There are choices available for every day wear, evening, bridal, mother of the bride, red carpet events, cruises, garden parties, beach weddings or just curling up with a good book on a chilly evening in front of a fire. 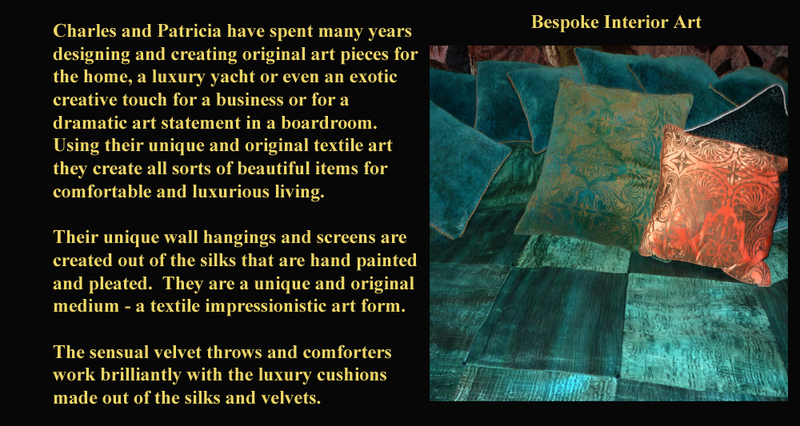 The words on this page ‘bespoke interior art’ are not quite so small, but I will type it out anyway. 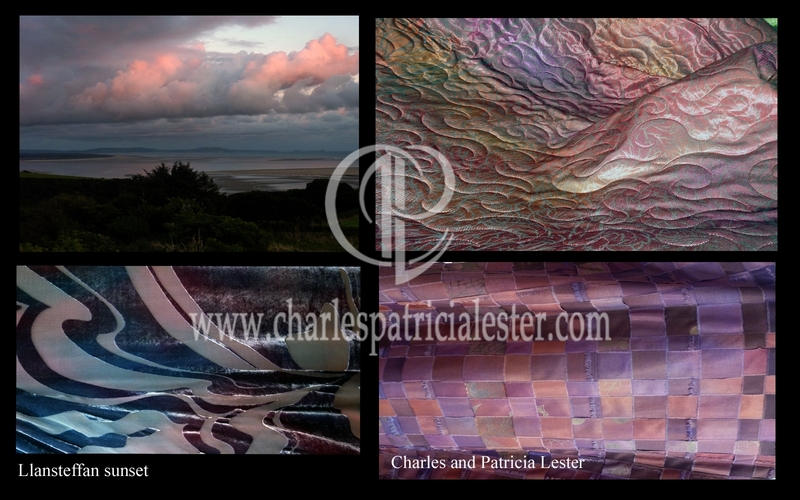 Charles and Patricia have spent many years designing and creating original art pieces for the home, a luxury yacht or even an exotic creative touch for a business or for a dramatic art statement in a corporate boardroom. 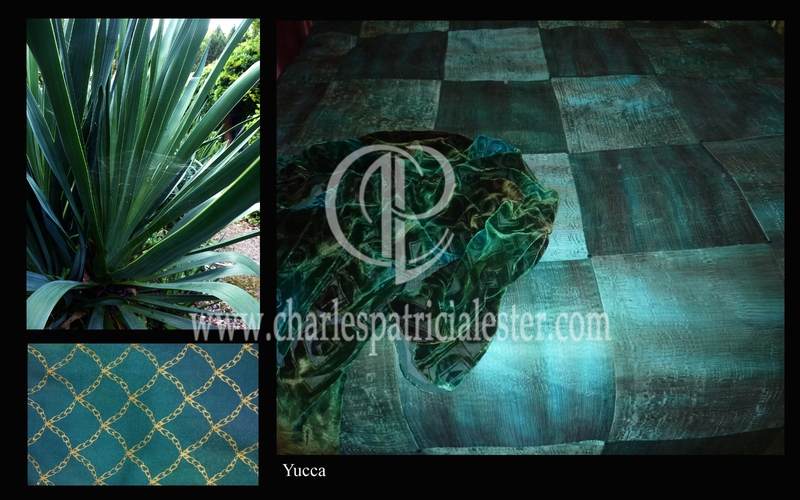 Using their unique and original textile art they create all sorts of beautiful items for comfortable and luxurious living. 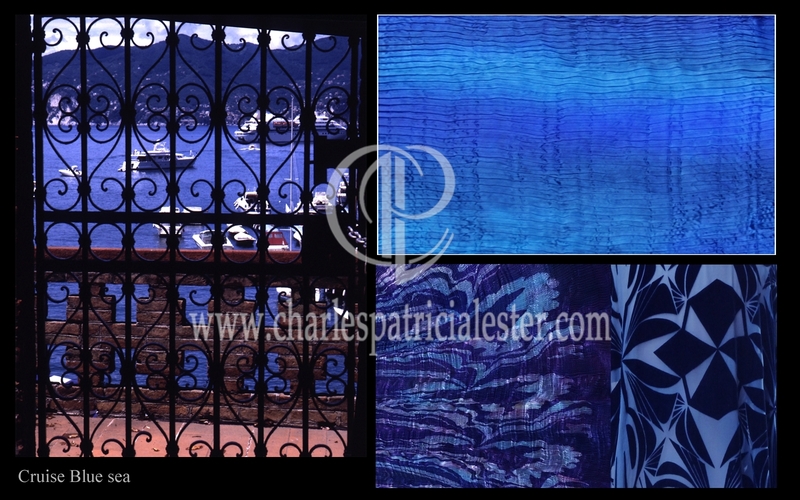 Their unique Wall Hangings and screens are created out of silks that are hand painted and pleated. 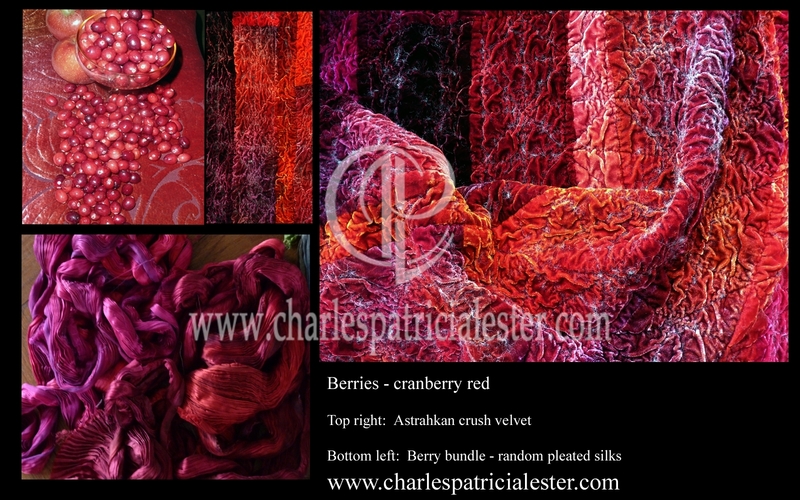 This is a new art form using pleated silk as a medium to create an impressionistic style of textile art. The sensual velvet throws and comforters work brilliantly with the luxury cushions made our of the silks and velvets. 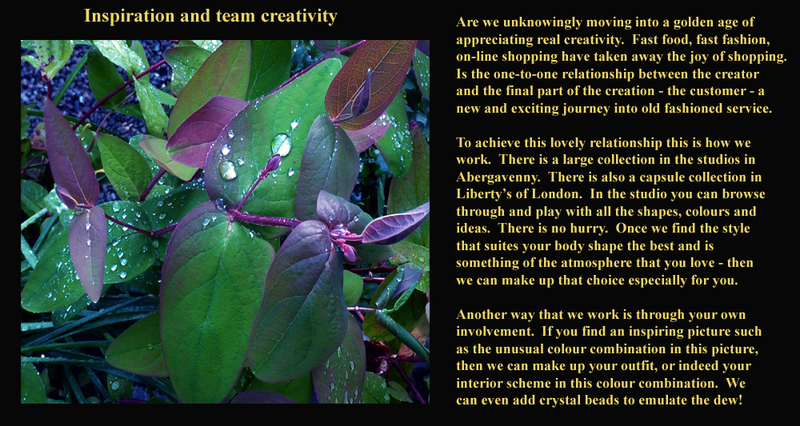 For the page ‘Inspiration and team creativity’ again I have typed it out because of the small print on the image. Are we unknowingly moving into a golden age of appreciating real creativity? Fast food, fast fashion, on-line shopping have taken away the joy of shopping. Is the one-to-one relationship between the creator and the final part of the creation – the customer – a new and exciting journey into service. To achieve this lovely relationship this is how we work. 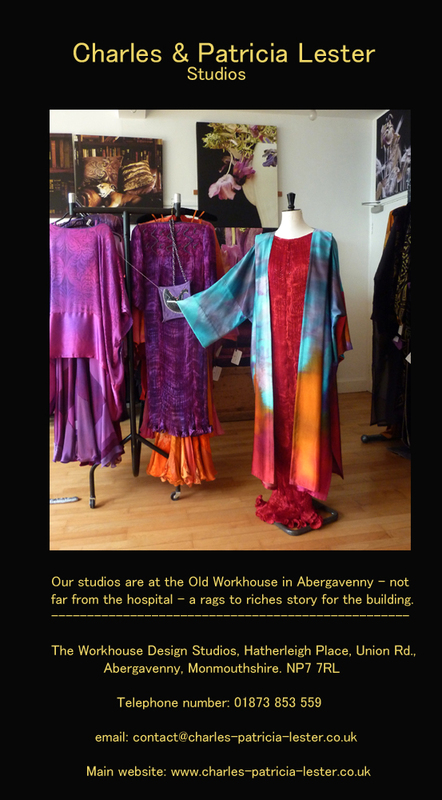 There is a large collection in the studios in Abergavenny. There is a capsule collection in Liberty’s of London. In the studios you can browse through all the shapes, colours and ideas. There is no hurry. Once we find the style that suites your body shape the best and is something of the atmosphere that you love – then we can make up that choice especially for you. Another way that we work is through your own involvement. If you find an inspiring picture, such as the unusual colour combination in this picture, then we can make up your outfit or indeed your interior scheme in this colour combination. We can even add crystal beads to emulate the dew! The post Inspired Textile Art appeared first on Gilded observations of a gilded world. 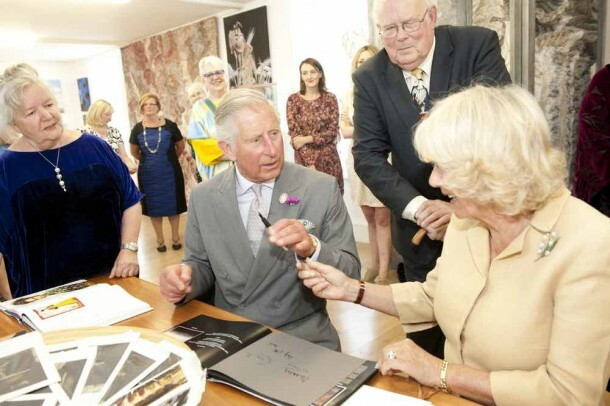 The post The Wedding of Prince Harry and Meghan appeared first on Gilded observations of a gilded world. The mothers of the bride and groom are still young enough to look elegant, feminine and it is their day too. Choosing an outfit often seems to be traumatic when it should be fun. It is the best possible excuse for the mother of the groom to re-look at herself and realise that she can still turn heads and so she should. 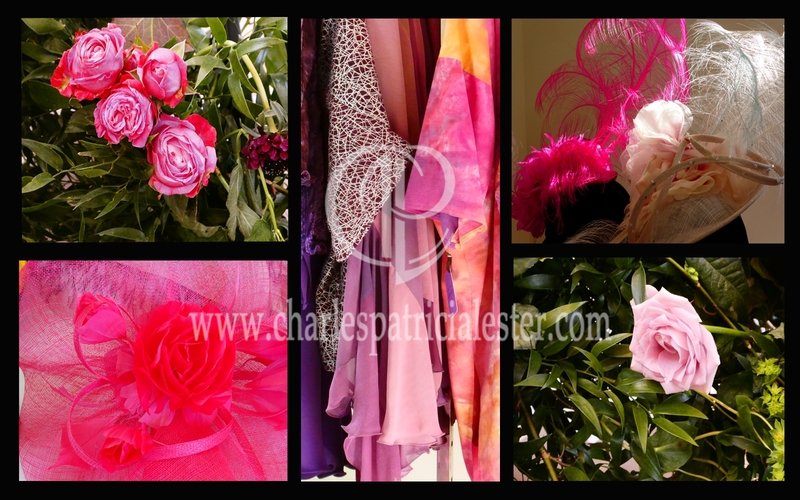 There should be a sense of adventure and excitement in choosing a hat for a wedding – and flowers. Personally I would prefer living plants that I can plant out in the garden as memories but mostly people love their bouquets to be unpretentious and abstract these days intertwined with wild flowers and wispy clouds of babies’ breath. Grandmothers, sisters, cousins, friends and aunts all enjoying a colourful wedding. 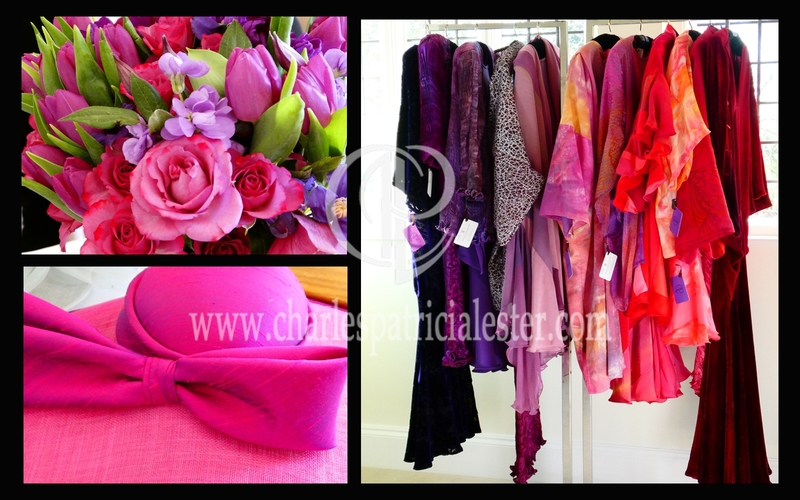 It is becoming more fashionable to have a colourful theme for a wedding – and persuading everyone to wear one colour is sometimes tricky, so giving a broader base of colours that somehow work together is a really good idea. There has to be enough variety that the grandmother, sister, friend, cousin and aunt to be able to find their own distinctive tone of colour. 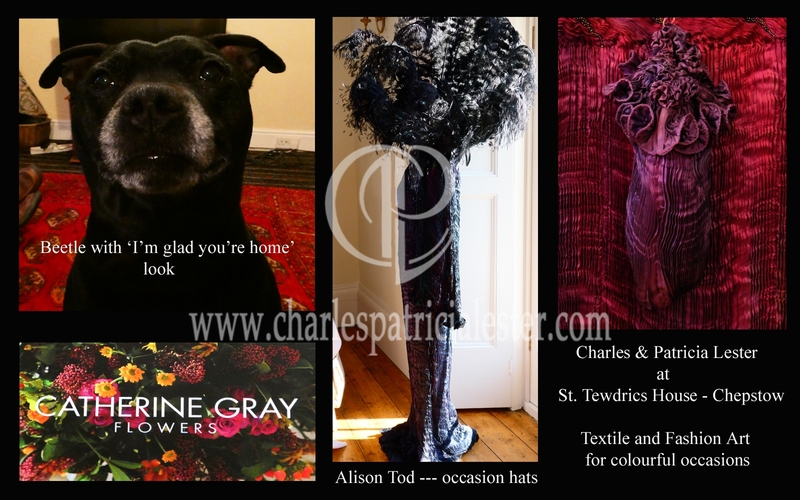 And my final picture says it all – the maker of the hats – Alison Tod, the flowers – Catherine Gray – and my best friend who was glad to see me home after a long day at St. Tewdrics House. There will be a new selection in Liberty’s in London in a week ready for Spring celebrations. Not that I can manage to think of Spring when it is so cold here in Wales. The post Colourful wedding appeared first on Gilded observations of a gilded world. 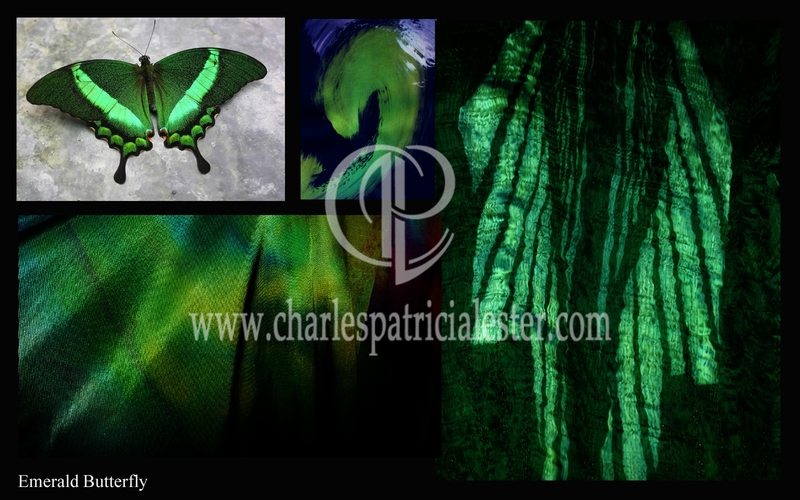 My passion for butterflies and moths was my first thought when a colour scheme of emerald was requested this week. 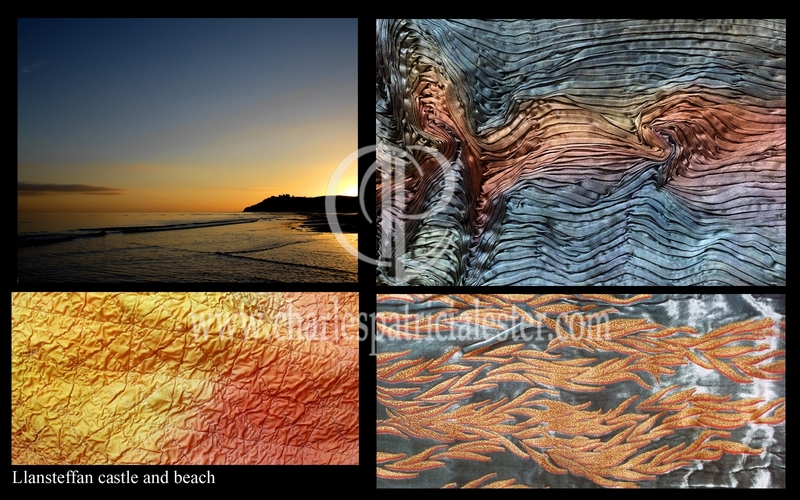 Nature’s colour palette provides us with such an extraordinary variety of colours and shapes. Butterflies and moths show so many that are perfectly beautiful and also can be rather strange. Look at the wings with a microscope and you see the amazing neatly layered tiles of iridescence. As for the beauty of emeralds – the gemstones – just perfectly glorious colours and rather mysterious in the way the light plays with the different tones of green. The butterfly shown in this group is one of many with this name – as well as moths. Now for the fabrics: On the right-hand side is pleated silk that has been painted in tones of emerald and then printed in order to remove the colour in the pattern. It has then been hand pleated. 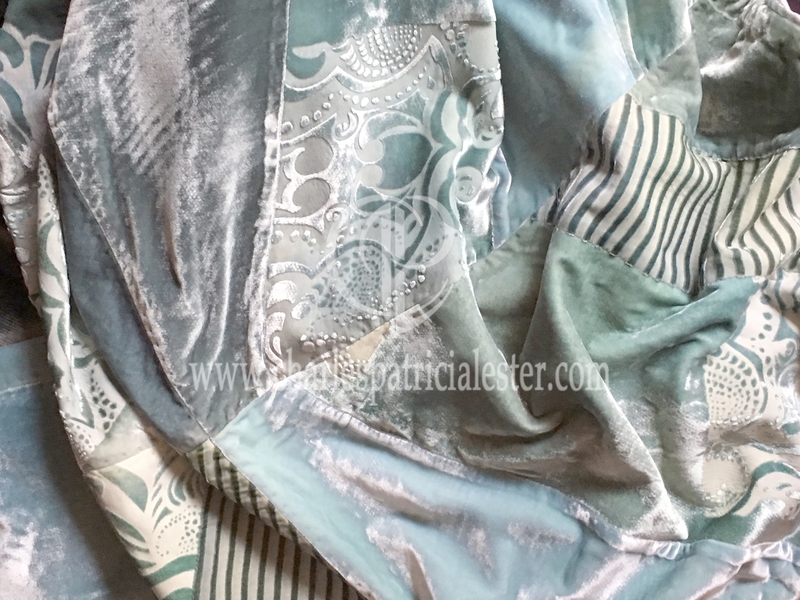 On the bottom left is a heavy satin painted in rich greens Centre top is a picture of a section of satin which after being painted has been hand painted with a type of bleach to remove colour. My title picture, lady and the roses, is a lovely example of Pre-Raphaelite art. 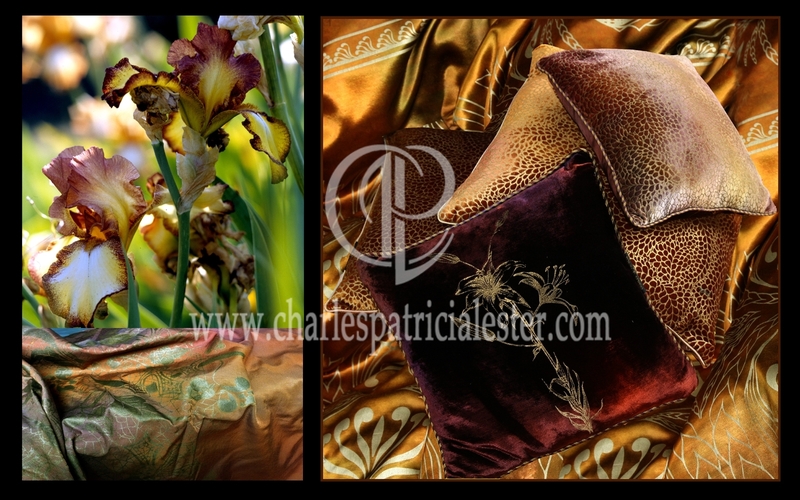 Perfect from which to draw inspiration for our luxury interior art. The bed cover is made up of squares of silk hand painted and pleated. 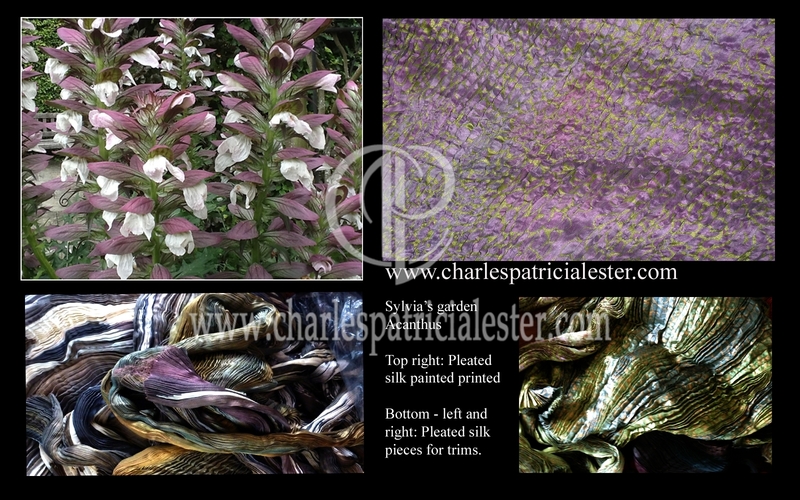 The backing is a deeper colour on crepe-back silk satin with a gold stripe print. 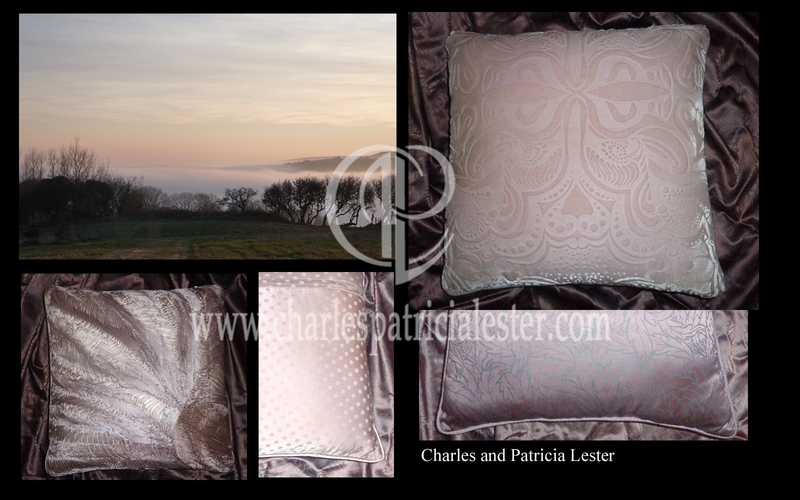 The cushions are a mixture of cotton velvet double printed. 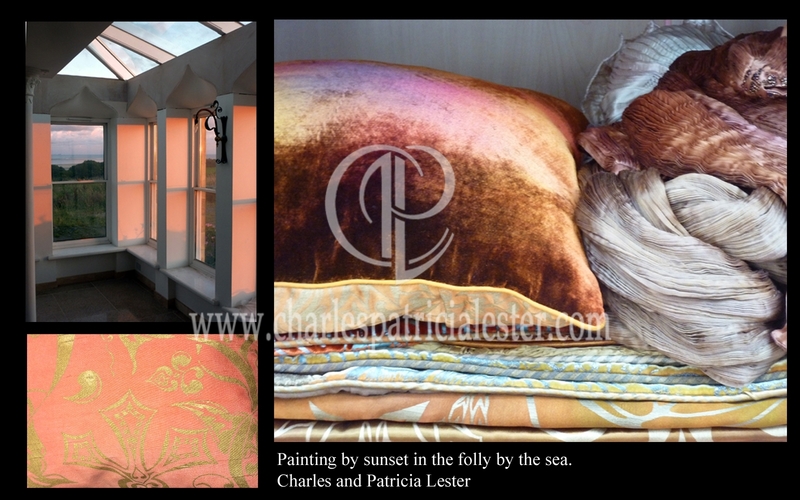 The orange cushion is made out of vintage silk velvet which we printed with a gold design. 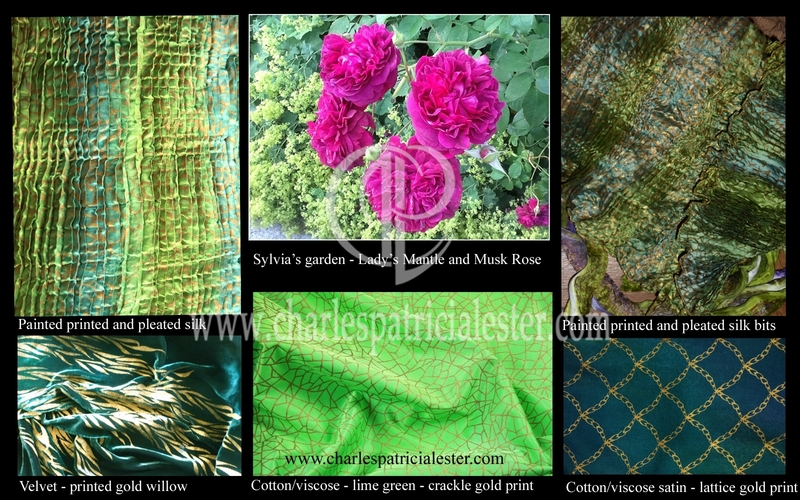 The fabric in the bottom left-hand corner is some green damask printed with gold. Another fine painting by Rossetti – such an amazing clear green dress so beautifully painted. 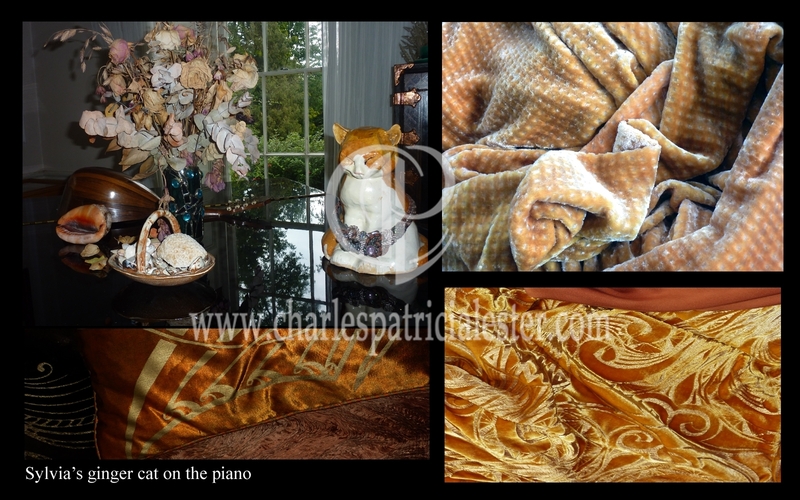 The main picture shows another piece of pleated silk with a phantom print. 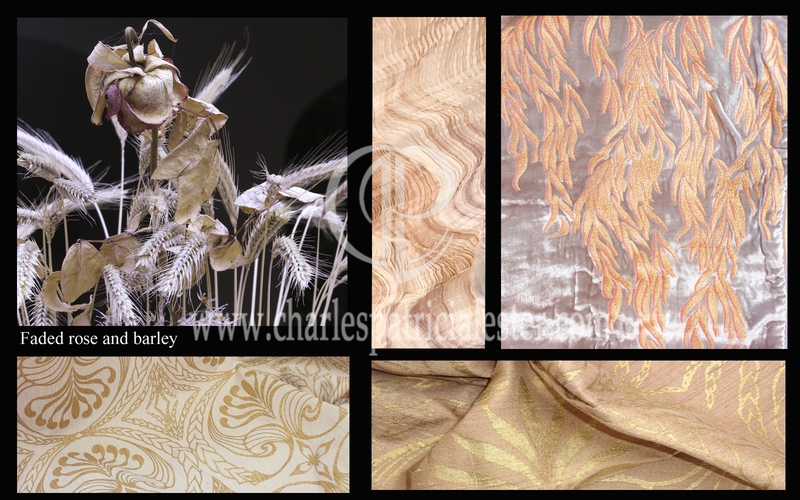 Bottom right are snippets of silk – the bolder print in the centre is ‘shadow printed’ to give the illusion of depth to the gold print. 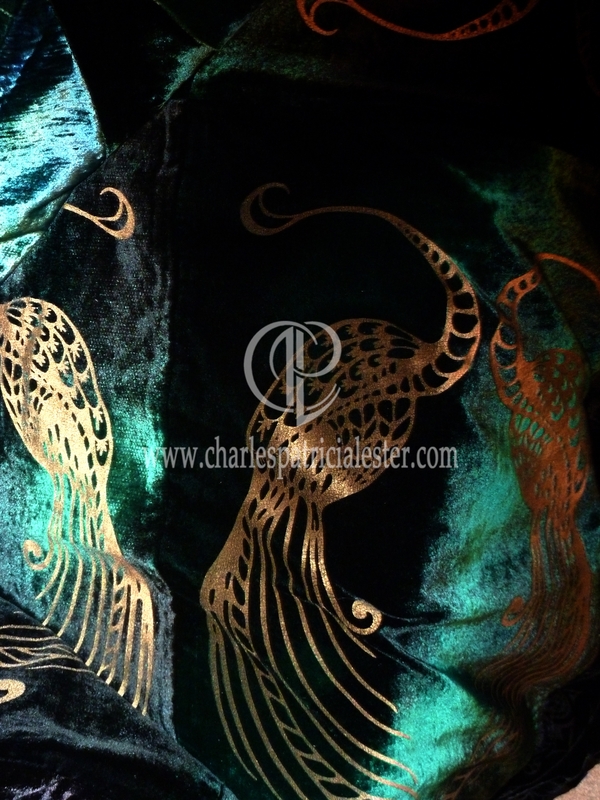 The second is a piece of silk noile that has a daintier print in gold. The left-hand corner is rich coloured satin in tones of green with highlights of tan. 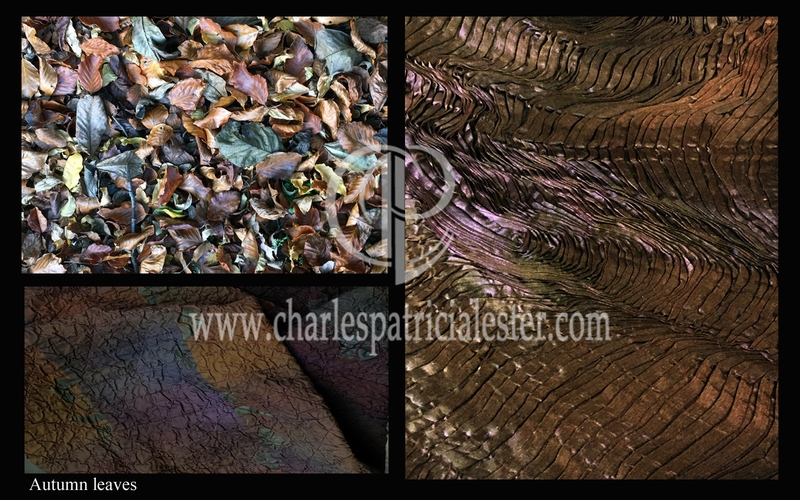 We constantly draw inspiration from nature and the texture of these leaves as well as the colours are nature’s gift of art. 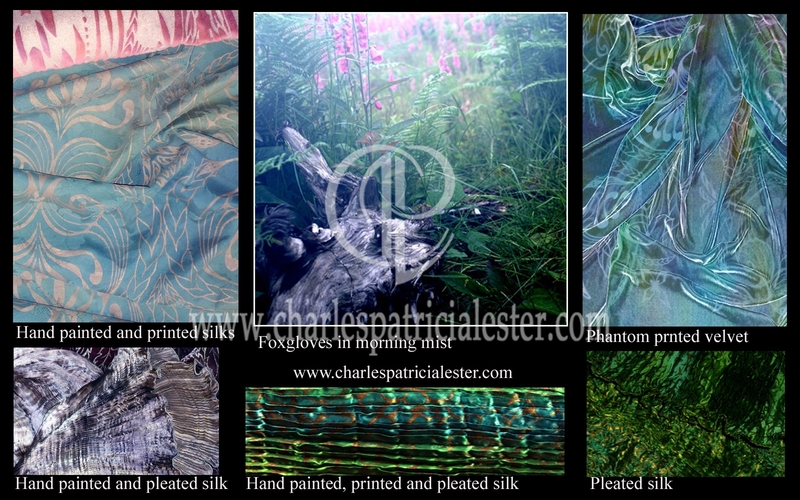 Silk hand painted and pleated is the main picture. 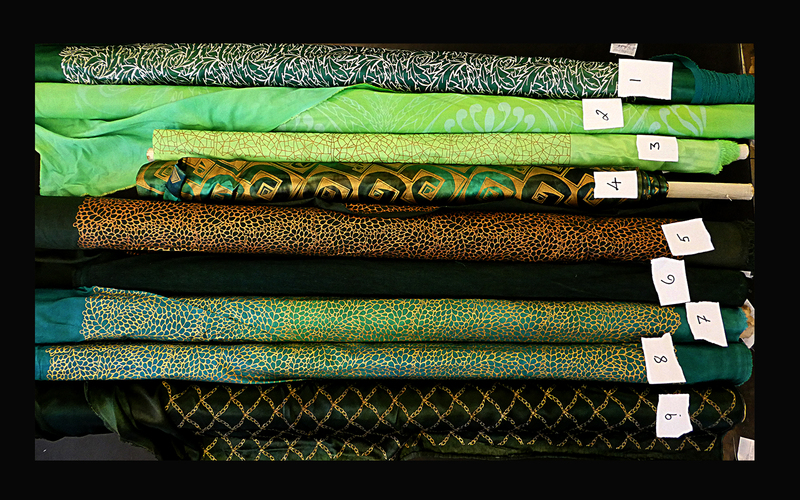 Bottom left-hand is satin in deep green with a silver print. 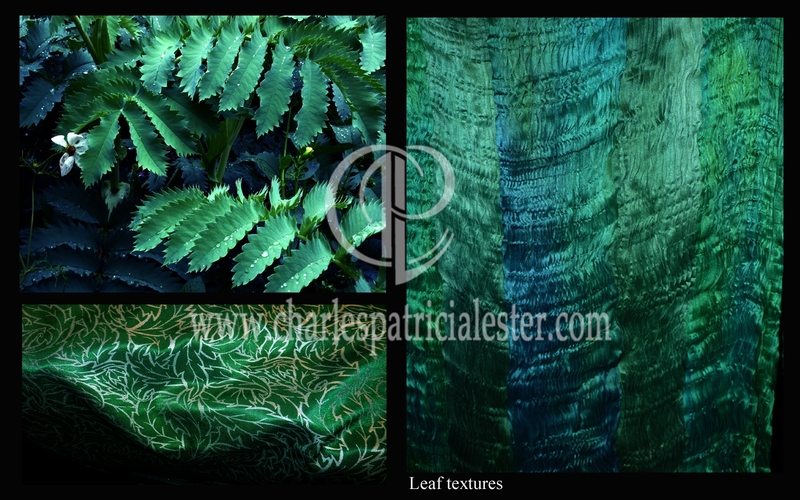 The design of this was inspired by acanthus leaves. 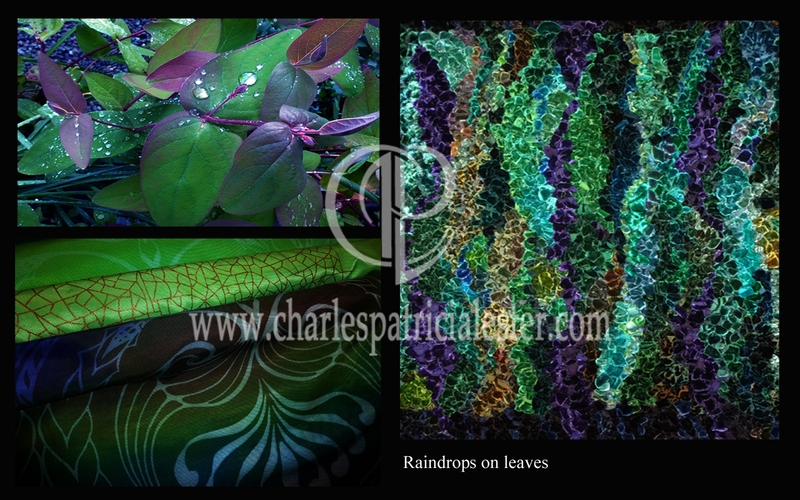 What a glorious colour combination in these leaves that have been be-jewelled with raindrops? 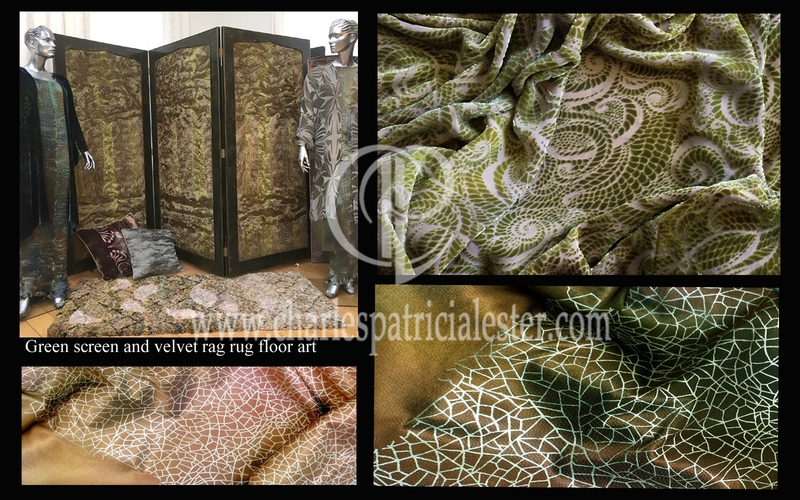 The main picture is a small rug created by Georgina using a traditional method of rag rug making, but instead of rags she uses strips of velvet. This is the most sensual rug on which you put your bare feet! A wonderful colour palette of vibrant slashes of emerald green, rich purples and hints of rust turns this rug into what we call ‘floor art’. 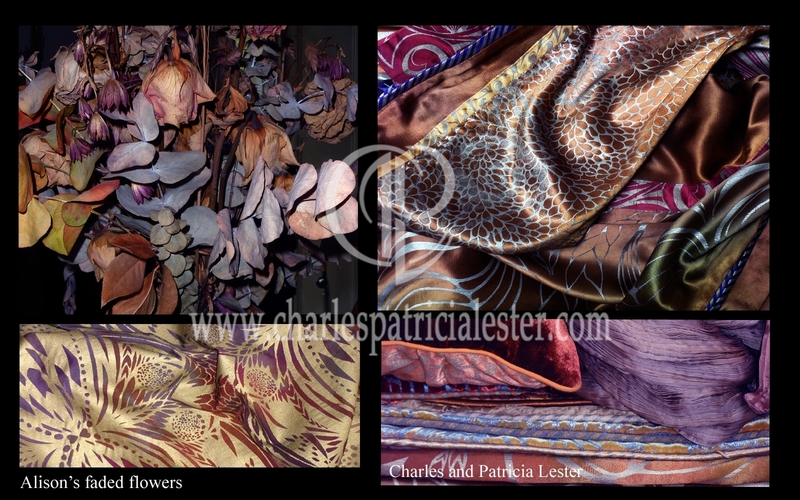 The fabrics in the corner are cotton/viscose satin – painted and printed. I love the colours in the shadows of plants. 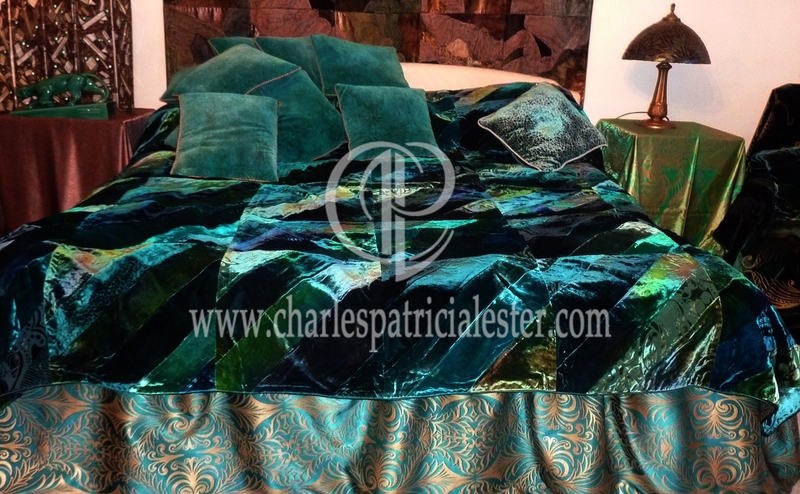 The main picture is of the silk pleated bedspread with a mix of emerald green velvet lying on the silk. 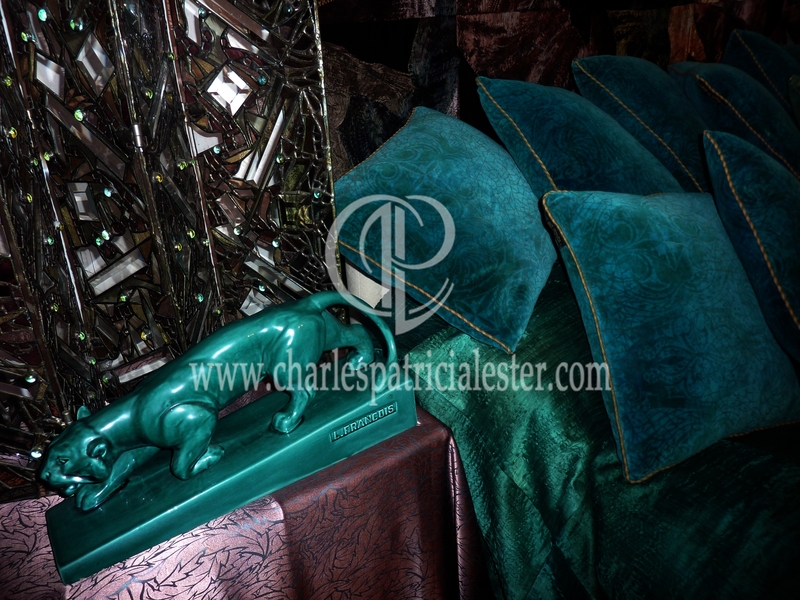 Luxury velvet cushions Emerald cotton velvet cushions, a silk pleated bedspread, a table cloth in mushroom ‘gill’ coloured satin and a green ceramic panther. The colours are captured in the bevel glass screen made by our daughter Georgina. 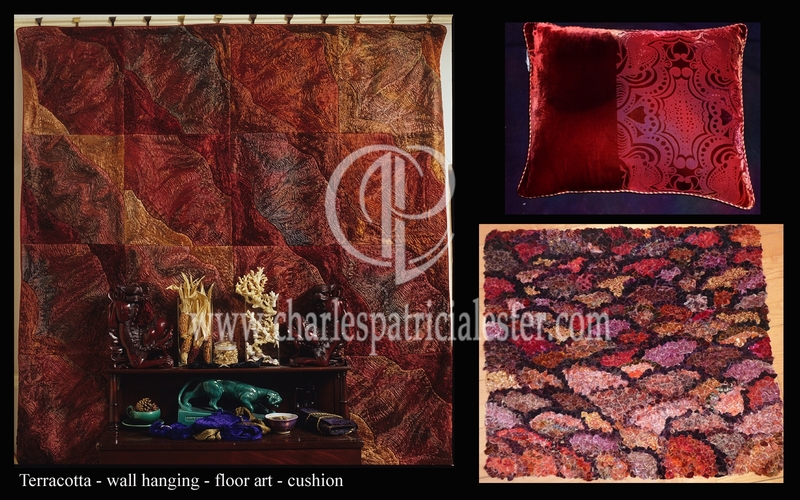 This adds an interesting dimension of the hard medium of glass to the sensual luxury of the interior textile art pieces. 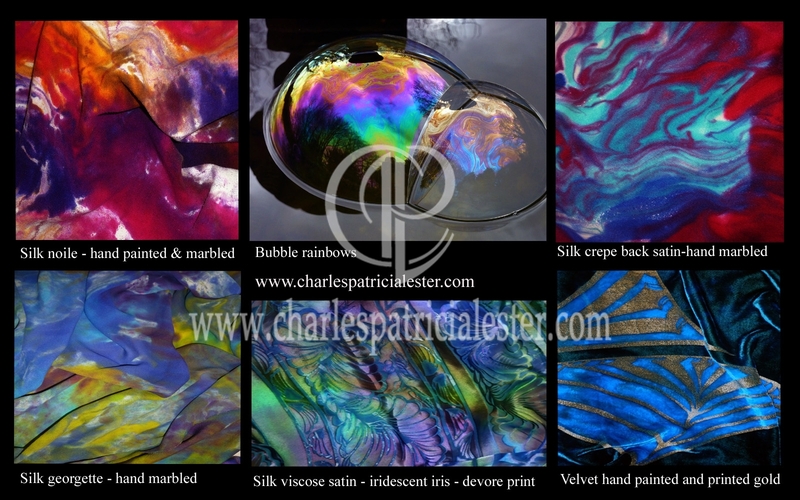 Painted Bubble art inspiration for interior design Bubbles intrigue me – the extraordinary way that the colours move in marbled patterns, change emphasis of colour, gradually almost completely disappear and finally pop – it is gone. 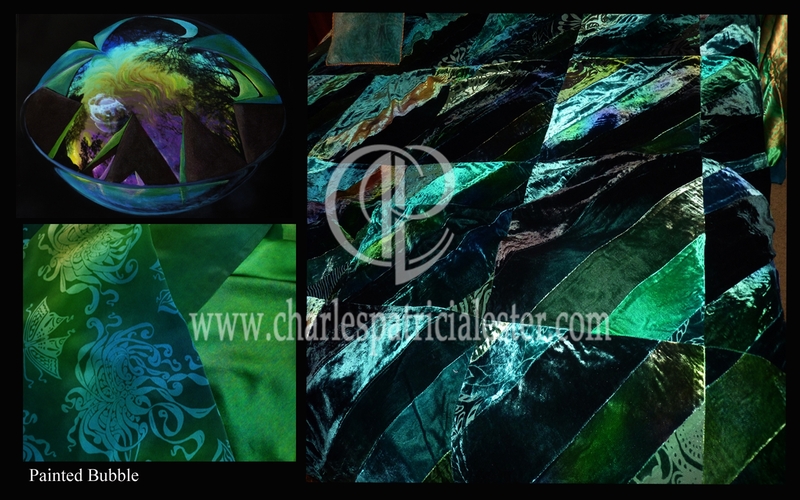 The main picture is of a patchwork velvet bedspread made out of many hues of emerald, with touches of purple and golden green. The silk satin, in the lower corner, is painted in a rainbow mix of muted colours and printed with a design inspired by butterflies and chrysanthemums. 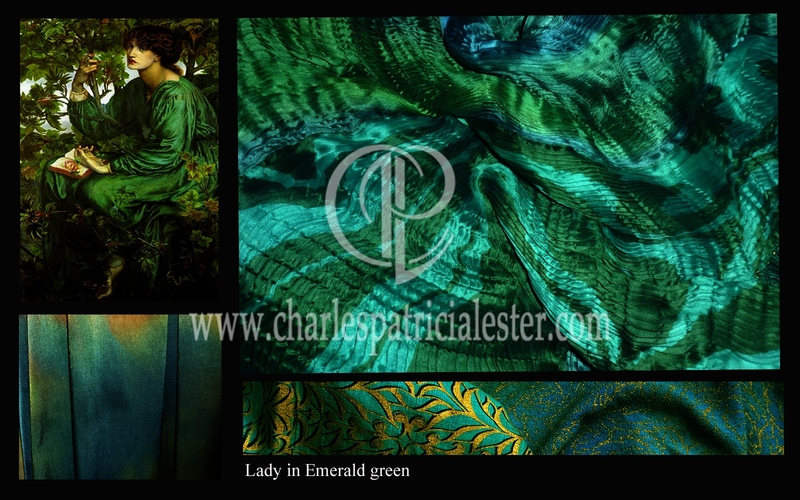 The beauty of emerald as a colour with all it variations are shown in this decadently luxurious bedspread. 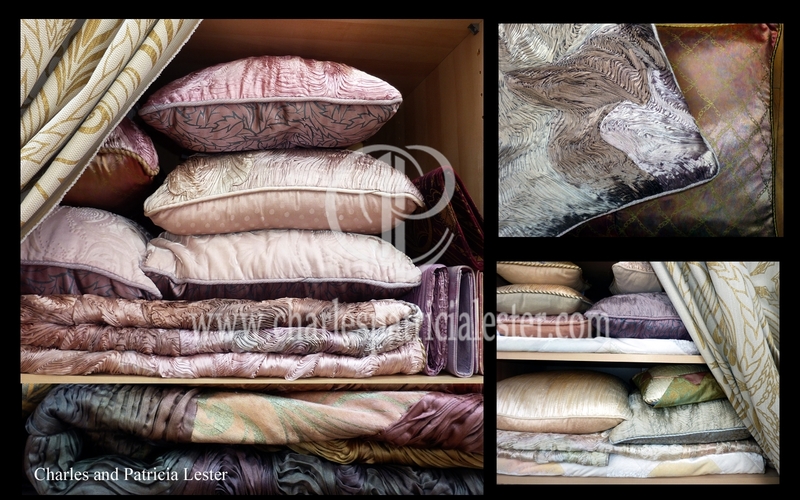 These bedspreads, bed-covers, throws and comforters, as well as cushions and pillows, can be made to commission in any colour-way to go with a chosen themed interior design project. The pleated velvet is very difficult to achieve but once done it is really beautiful to wear – it is wonderfully luxurious as a comforter. 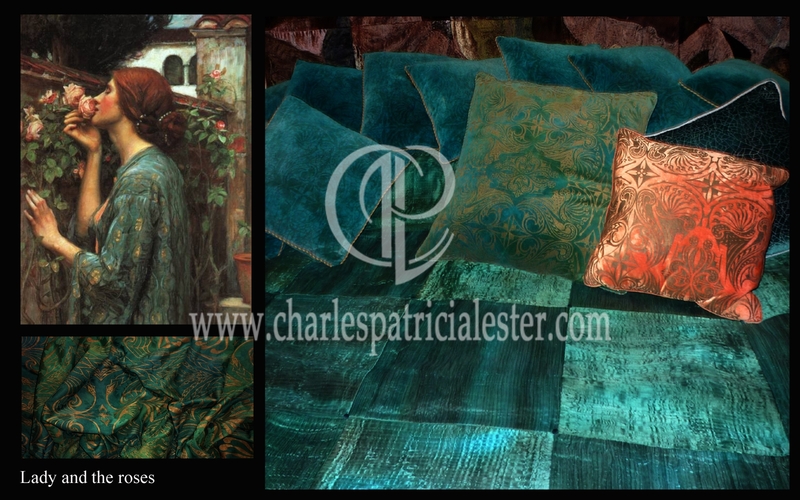 https://charlespatricialester.com/product/dramatic-velvet-bedcover/ We have a large and varied selection of interior art pieces and accessories ranging from very large wall hangings made out of the pleated silk, to bedspreads, throws, cushions, lavender pouches. We are constantly chasing new ideas such as quilted throws and some new experiments with crushed and quilted silks and velvets. We are always exploring new ways to colour and texture fabrics using craftsmanship rather than the modern way with digital printing and other sophisticated technology. Our work is about the skills of hand-crafting using traditional techniques as a base then pushing out the boundaries by ignoring tradition and taking other routes. There is always something new to learn and develop and we are never averse to making mistakes because those mistakes often lead to a new and exciting process or skill. The post The beauty of Emeralds appeared first on Gilded observations of a gilded world. The current project has been inspired by an extraordinary gallery in San Francisco introduced to me by a friend. The Zentner Collection specialising in Asian and Oriental Art and Antiques is an amazing place to find oriental inspiration. Another source of inspiration is from a study of the origins of Liberty’s in London. 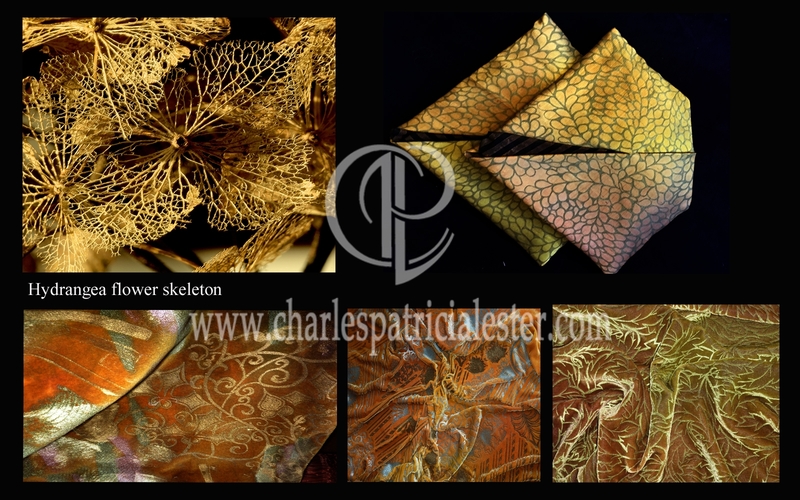 http://www.zentnercollection.com For an interior designer who has such a theme then these pieces that we have created will act as a sumptuous foil for exotic oriental antiques and art. So to help me gather my thoughts I have wandered around our home and taken photographs of bits and pieces. The antiques are either originally from China and Japan, or like the tea-chest something that is inspired by oriental furniture. A number of years ago we went to Hong Kong and bought some interesting artefacts. And Georgina, our daughter, visited China when she was just 18. With our credit card in her pocket she bought some fabulous things that now adorn our home. 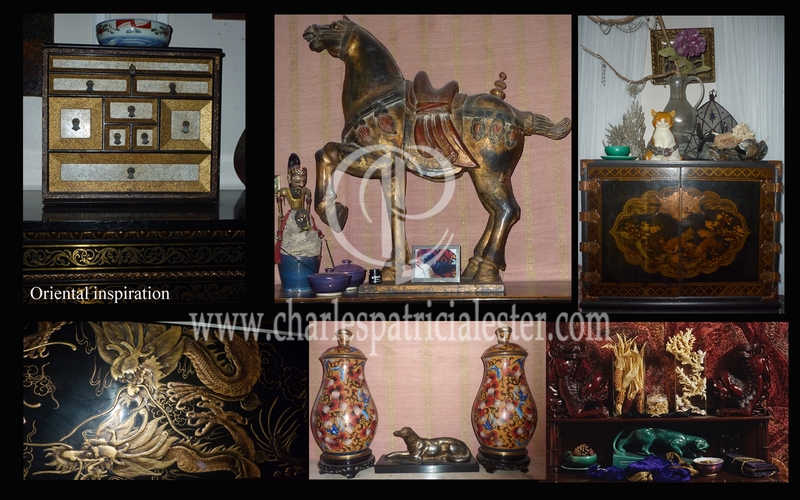 The crates arrived carrying the carved wooden Tang horse in those lovely faded beaten up colours, the fine cloisonné jars, the carved dogs. Most of all she brought back some enduring memories. 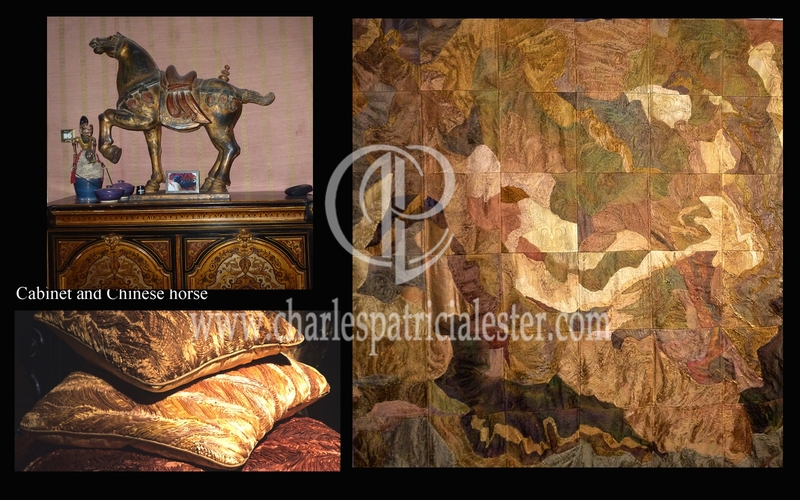 Shown with this Chinese carved wood ‘Tang’ horse is a wall hanging created out of pleated silk. The fabric has been painted and pleated by hand. 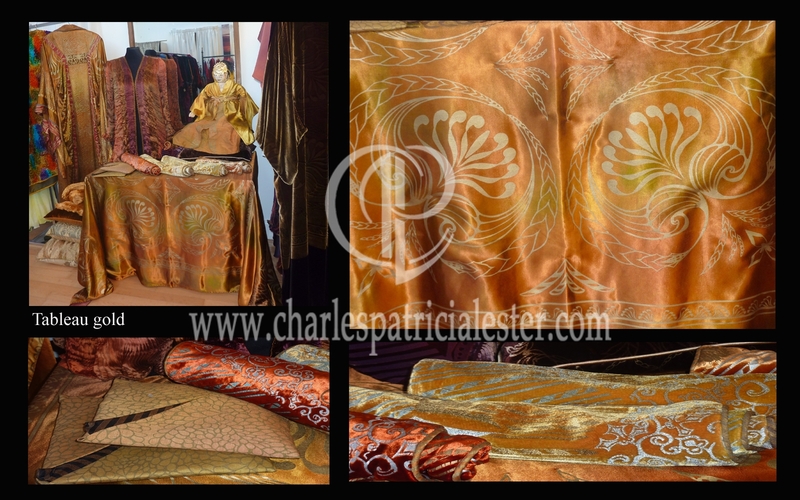 It is then intricately stitched into abstract swirls of rich gold autumn colours. 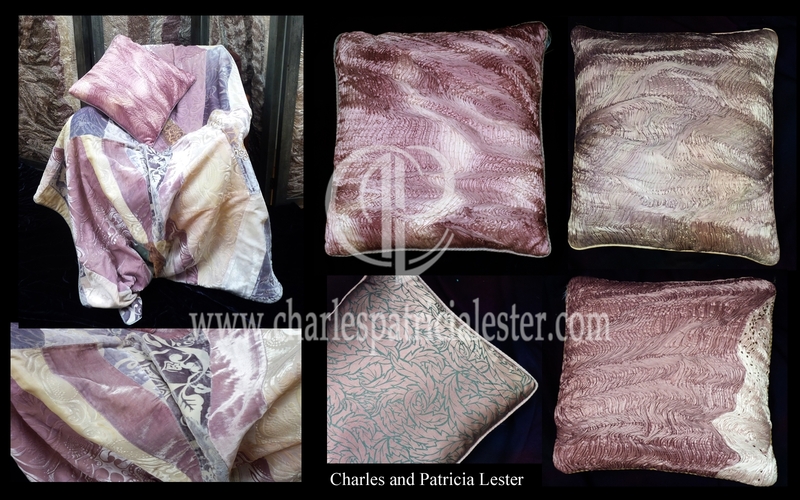 The same pleated silk fabric has been turned into luxurious cushions. This group has an extraordinary picture of a veined hydrangea flower – one of Charles’s photographs that is so beautiful in its simplicity. 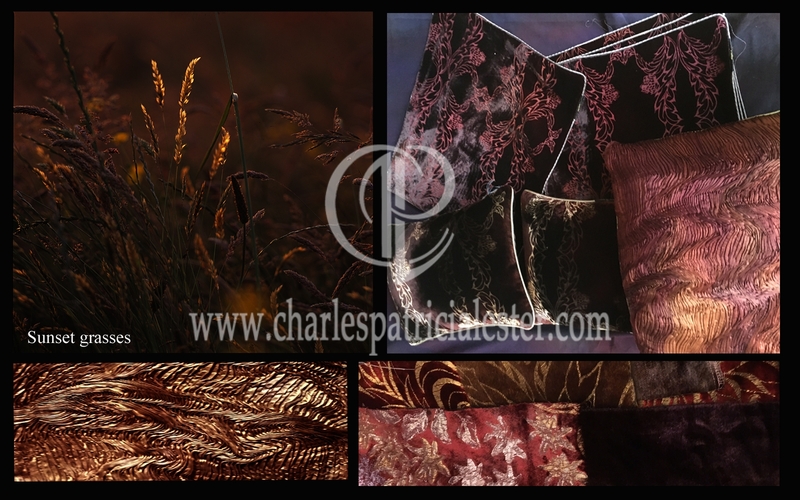 One idea for this project was to focus on the colours of autumn. These leaves were just outside our back door and they just looked incredibly beautiful so I took a photograph. I then went into the studio to look for colour and texture partners. 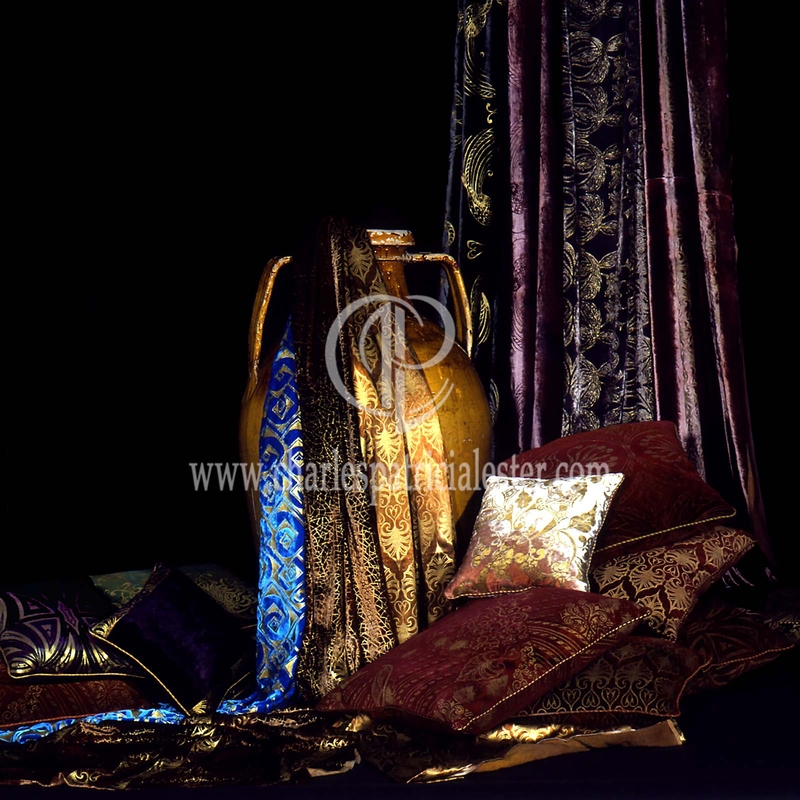 I was excited to find ones that had textures that would work well with different aspects of Oriental luxury furniture and artefacts. The lower left hand piece of fabric is a new experiment which is crushed evenly, not randomly to give it an interesting dimension. The muted sheen on the fabric works well with unpolished wood. It is not easy to achieve, so there will not be many pieces like these but this piece worked so well with the tones and texture of the leaves. This is another experiment – however I might never do again because it took many weeks of hand work because all the quilting and beading was done by hand. 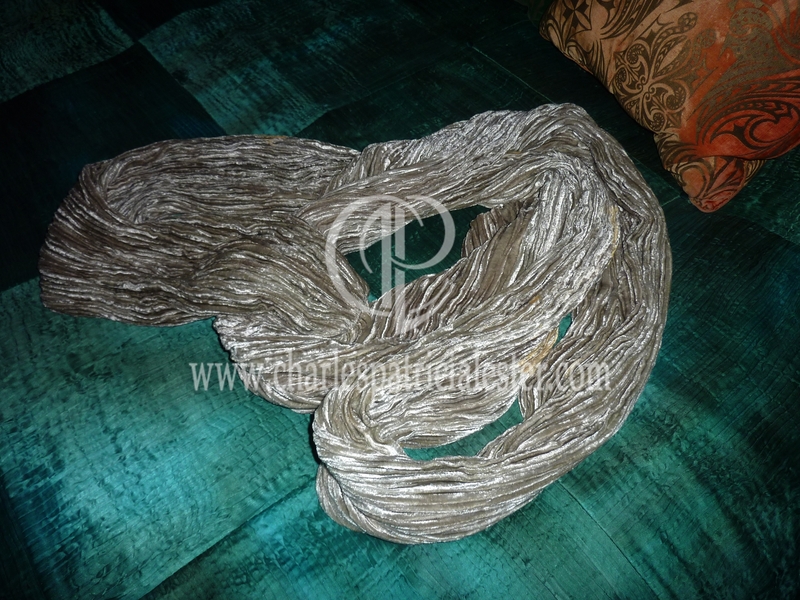 I have two pieces like this which will be turned into very decadent luxury throws. The little Japanese cabinet is a delight – inlaid with egg-shells, unexpectedly we found this in New Zealand and just had to bring it home. 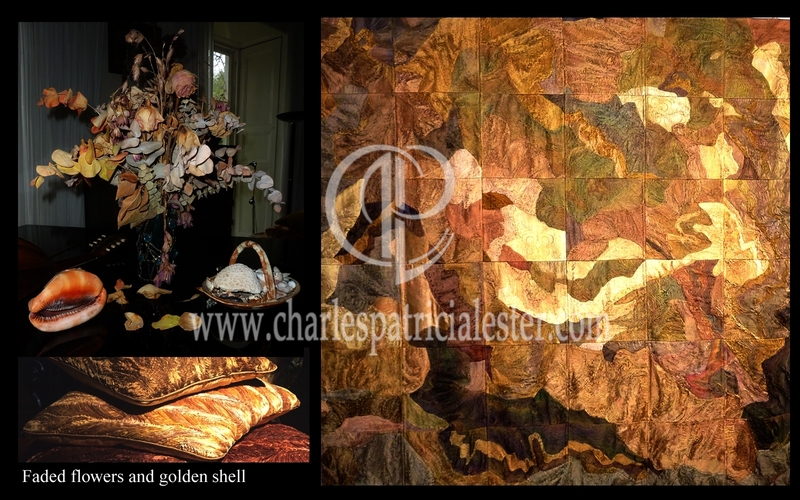 Choosing the autumn colours as a theme I realised that the ‘Sun’ doll from the opera Iris, that we costumed for Opera Holland Park a few years ago, would make a perfect centre piece for this tableau of gold textiles. When the sun has almost set it leaves a touch of sunshine on the tops of the grasses that is quite magical. 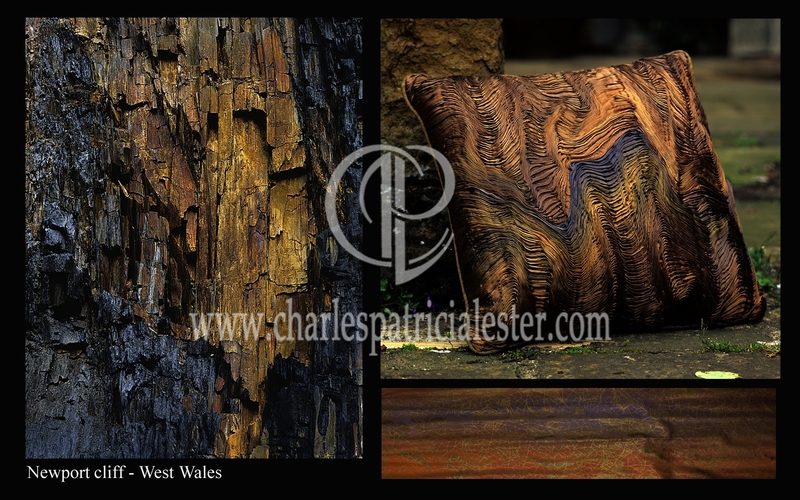 The colours in the rocks on the cliffs in Newport West Wales inspired Charles to do a series of photographs. 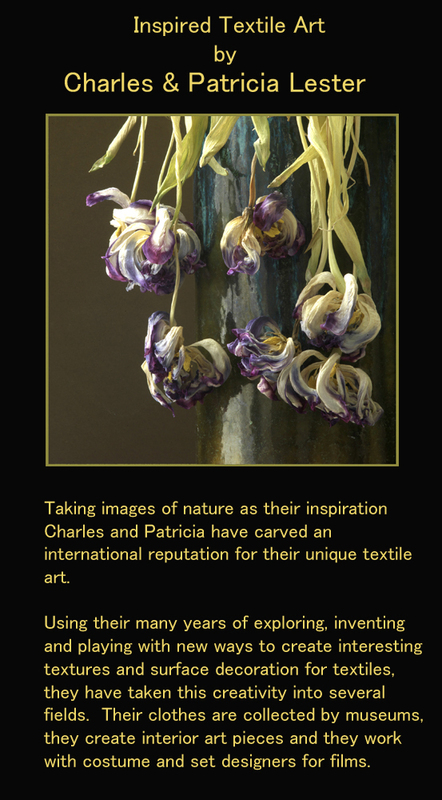 What a wonderful resource of inspiration for our interior art textiles. An echo of colours of tarnished bronze and distressed painted furniture. For a gentle calm atmosphere – soft weak tea colours and willow leaves echo the delicate colours that a bright pink rose turns as it fades into crumpled petals – so beautiful. Choosing the screen for this colour theme – the darker shades of celadon – merging into seaweed, old bronze and tarnished silver. 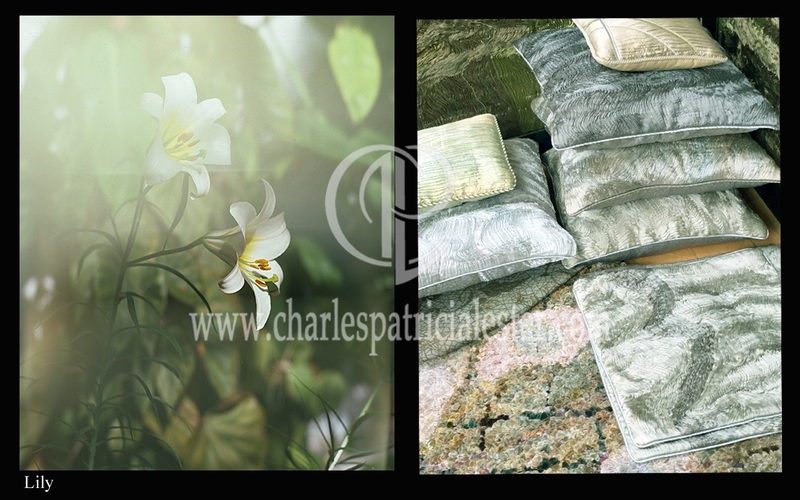 Another of Charles’s photographs has the perfect tones of colour for the story of oriental inspiration in carved jade – those delicate tones of celadon with echoes of deeper shadows highlighting the softness of the colour. Velvet is the most sensual fabric for luxurious throws and pillows – luxury to curl up in. Neutral colours for a modern interior scheme – then a touch of real colour as a highlight. What exactly is the colour ‘greiges’ – I designed a group of colours a few years ago and in searching for a name I decided on ‘British rail coffee’ – a nasty brew that was a greyish beige colour. The background for this cushion is one of Georgina’s amazing rugs made out of velvet using the traditional rag rug technique. These really are a decadent luxury – delicious for bare feet! When doing the research for costuming the opera ‘Iris’ I found that the Buddhist monks and nuns, who had given up all worldly goods, had nothing to wear other than rags donated by their patrons. If their patron was an ordinary working man – his patched ‘kesa’ would be a patchwork of heavily worn and stressed textiles. 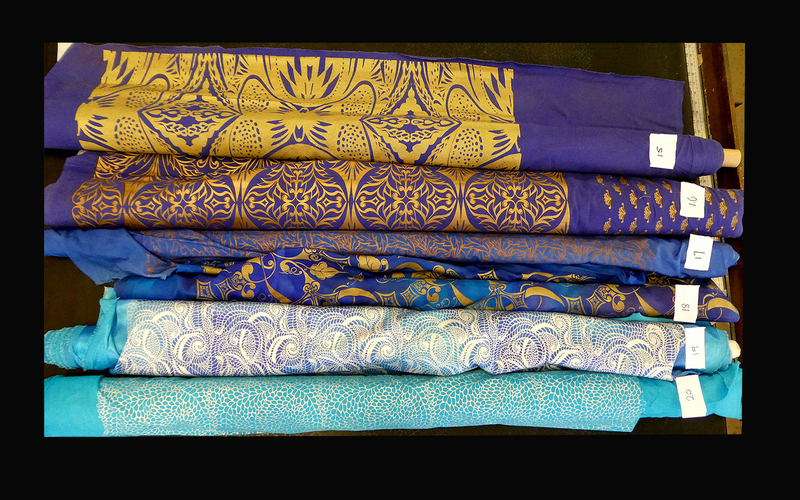 However if the patron was a wealthy person, then the kesa would be made, still in patches, but of lavish silk brocades. 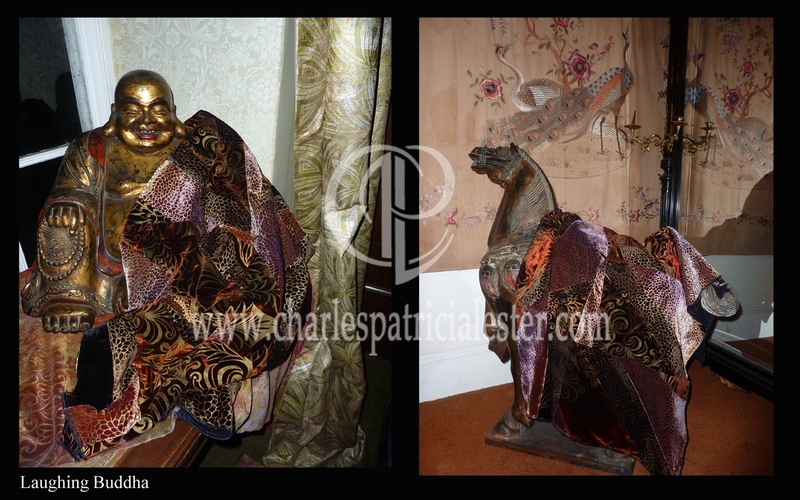 So our laughing Buddha is wearing a luxurious patchwork of printed silk velvets. I need to study the form again because I seem to remember that the symbolism and order of the patches have special significance. When my memory is refreshed I will add the details to the blog. 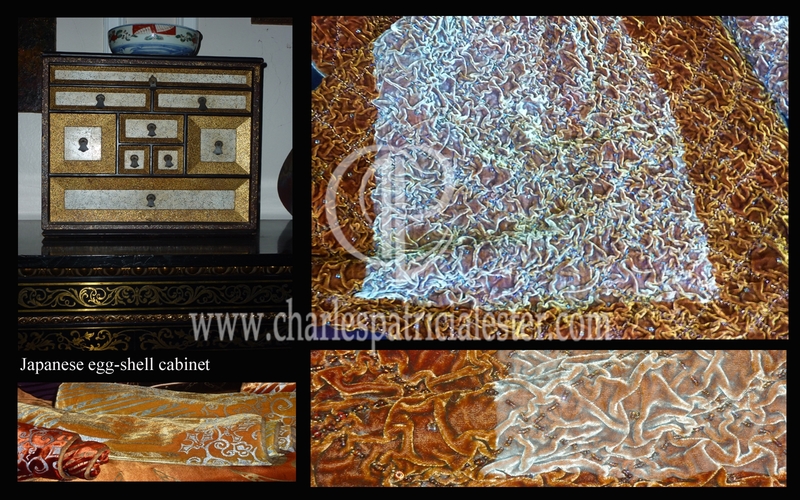 I love the richness that a background of black gives to painted lacquer furniture and ornaments. The post Oriental Inspiration appeared first on Gilded observations of a gilded world. 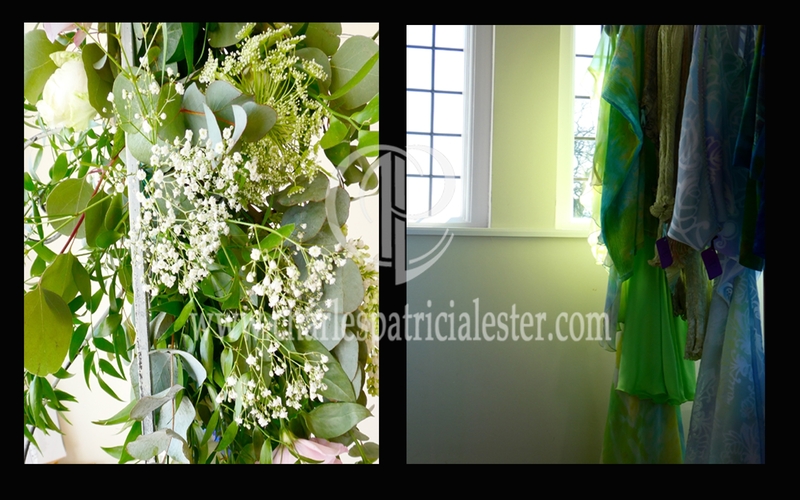 The request for this project was for colour inspirations from garden flowers. 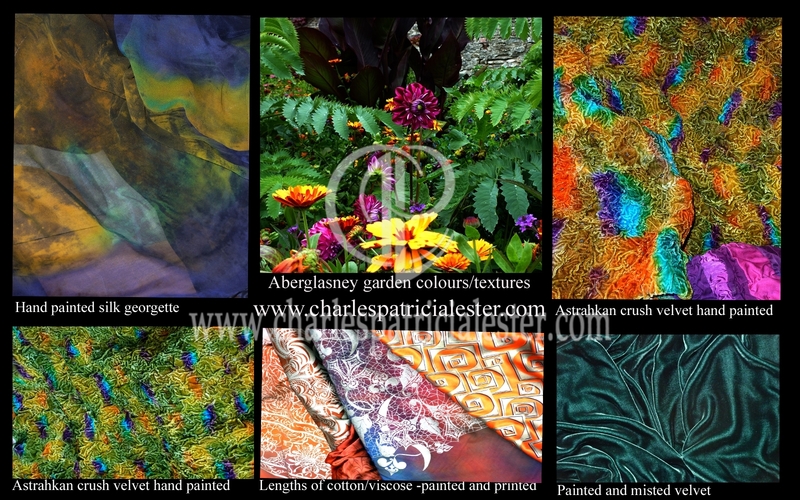 What a delight – my favourite thing is to explore colours that nature gives us along with extraordinary textures. So photographs found of our own garden spaces, the lovely garden at Aberglasney and Charles’s sister Sylvia’s delightfully crammed and colourful garden. Not exactly garden flowers but the colours that act as a foil for the vibrant or subtle beauty of flowers in unexpected places. The post Inspirations taken from the garden appeared first on Gilded observations of a gilded world. 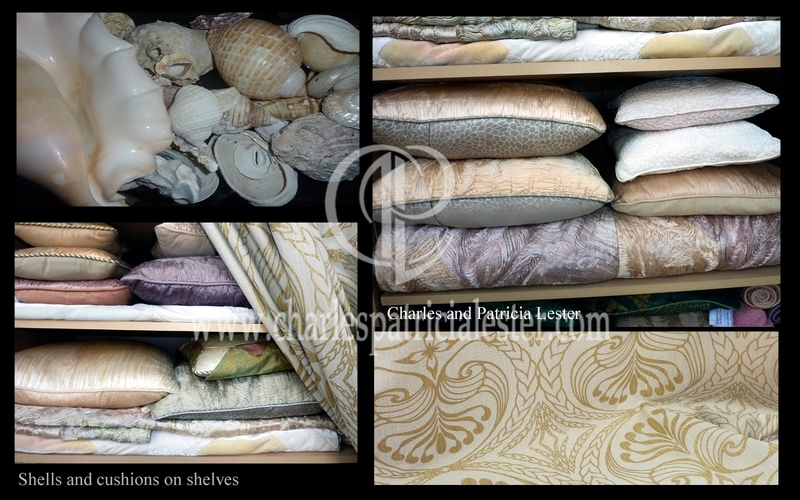 We are bombarded with colour inspirations when by the sea, the sky and the glorious mix of shells thrown up by the waves. 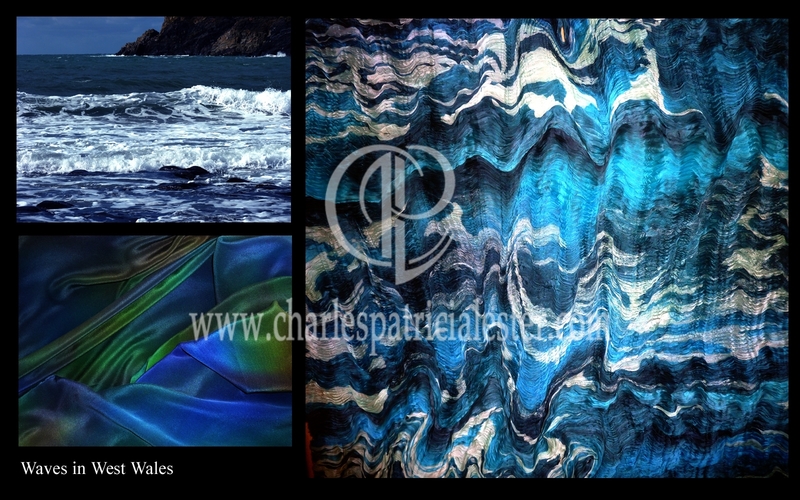 So here are a few images of seascapes and our fabrics and interior art pieces that are creations inspired by the sea, sky and shells. 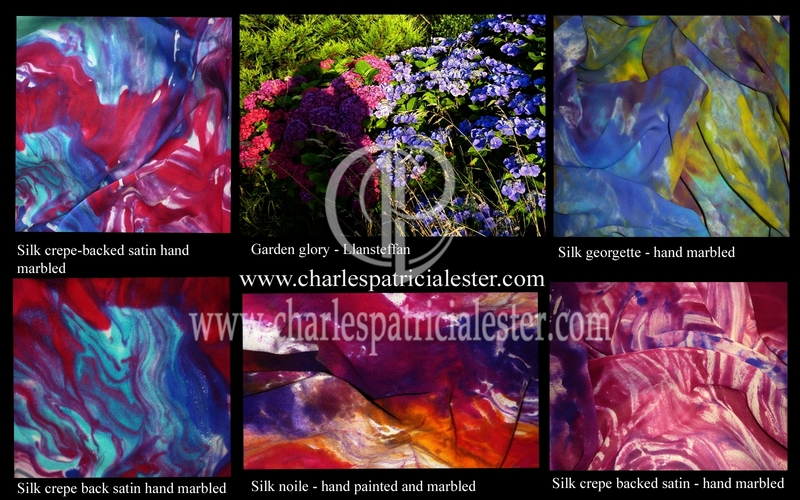 The intense vivid colours of the Mediterranean sea and the coastal gardens brightly spattered with brilliant colours. New Zealand’s amazingly varied features on land and the glorious sea and coastal beauty is something that you cannot imagine being so perfect until you experience it yourself. The wild coastal waters of West Wales – stormy seas and summer calm – a different atmosphere every single day. Unspoilt beauty of remote villages in West Wales. 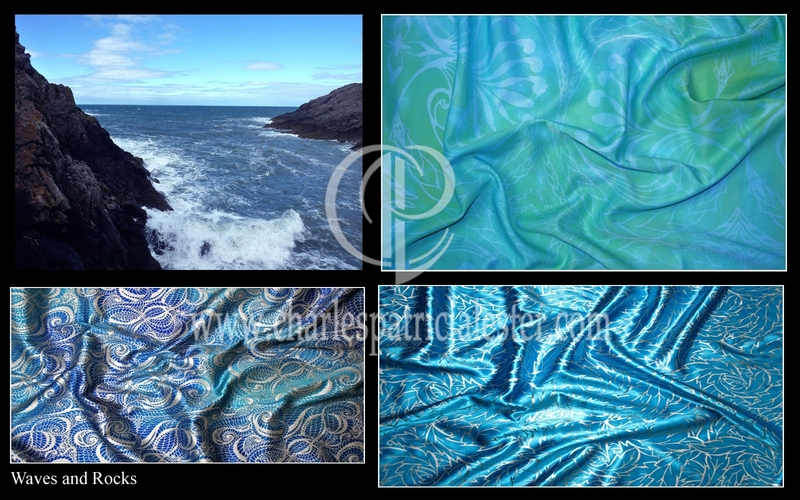 Dramatic sea, wild-life and the contrast of mill-pond days – perfect for inspiring colours and textures. 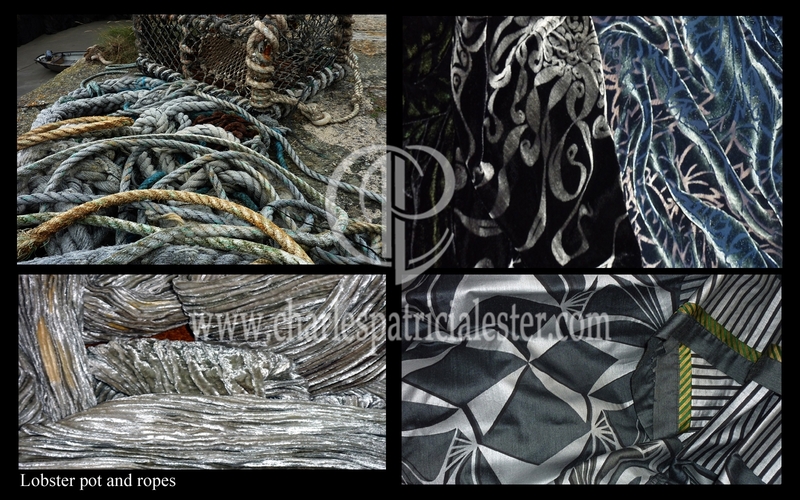 Working coastal village where fishermen prepare their lobster pots and a textile designer captures the images of their toil to turn into textile art. Crabs, seaweed, shells, lichen on rust and faded flowers – the muted tones of beachside walks. Every day, all through the day, the sky and sea display a different picture – breathtaking beauty from which to capture ideas for colours and textures. 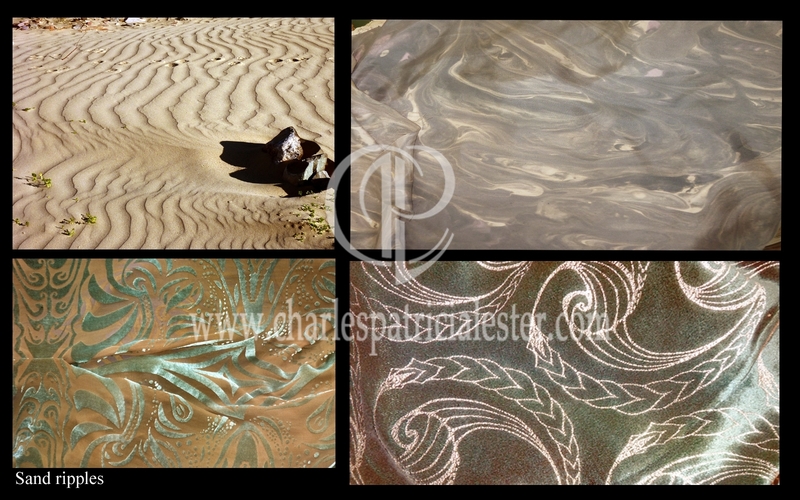 A walk along the beach when the tide is out and the wind has ceased its creative work with the sand. A vies from Charles and Patricia’s bedroom window – imagine waking up to that picture in all its weathered variety every day? The intriguing shapes and organic swirls in shells have inspired designers throughout time – architectural staircases formed like the centre of a shell, textiles, paintings, ceramics, endless variety of shapes taken from nature. The post Sea sky shells colour inspirations appeared first on Gilded observations of a gilded world. 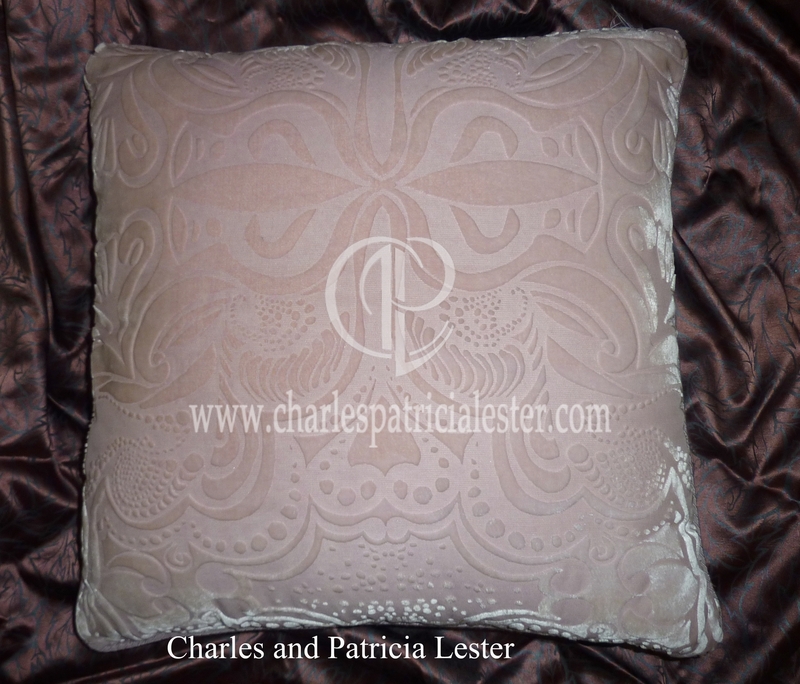 Velvet devore cushion in shell pink. 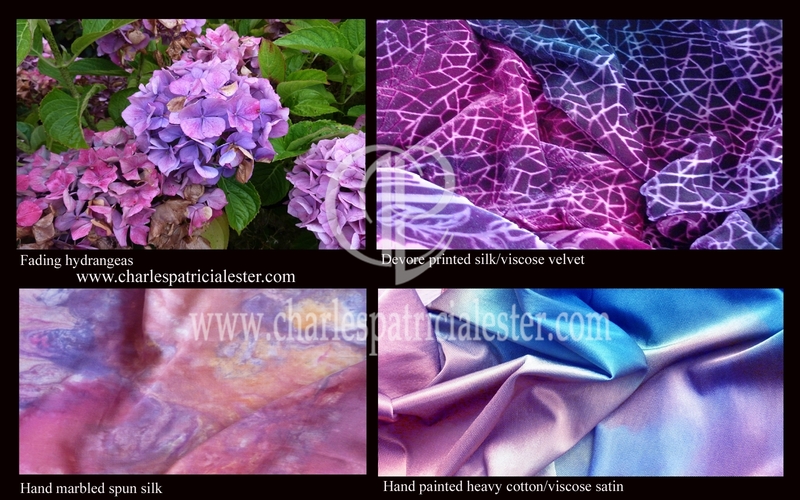 Viscose and silk top – viscose and cotton satin backing. 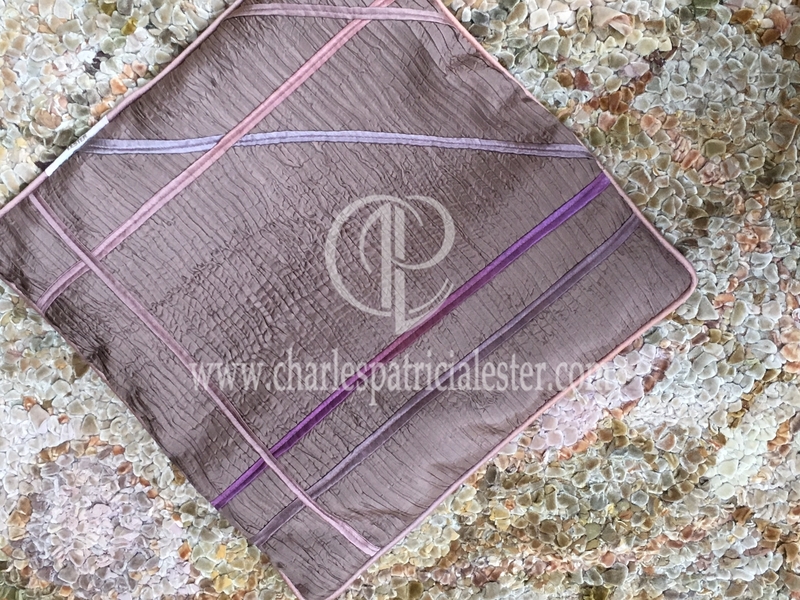 Pleated silk cushion in tones of faded slate. Backing silk crepe back satin with spot detail. 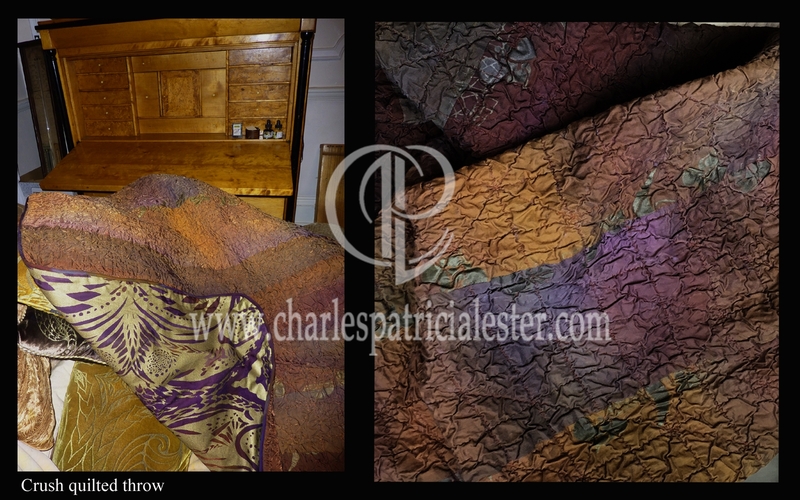 Patchwork throw in velvet. 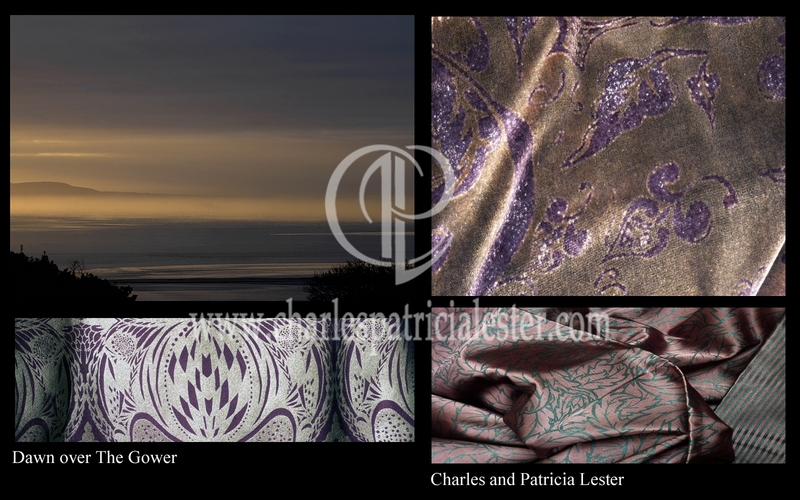 Selection of pleated silk cushions showing backing in viscose and cotton satin – print: acanthus leaf. 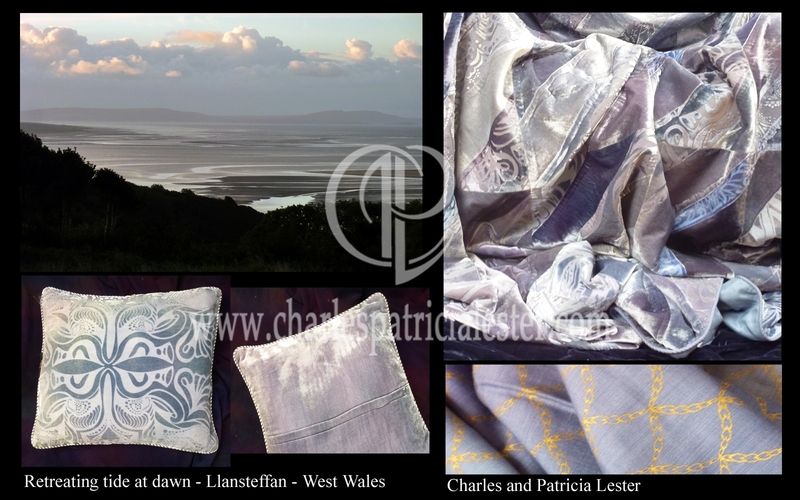 top right – hand painted and hand printed fabric intricately quilted. 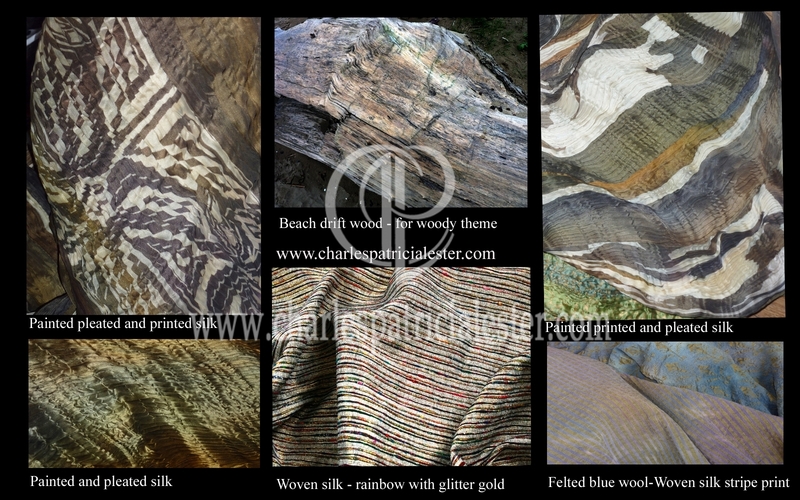 bottom right – hand painted strips of fabric frayed and woven. 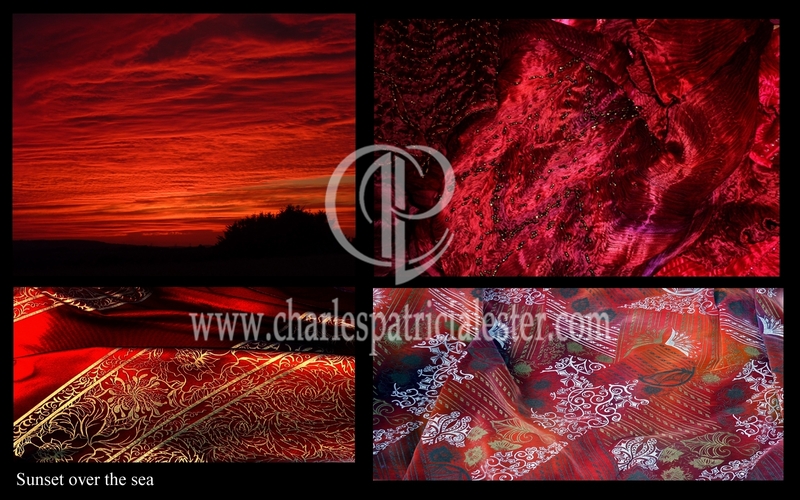 bottom left – devore velvet – reflection print. The post Luxury interior art in tones of summer pink appeared first on Gilded observations of a gilded world.